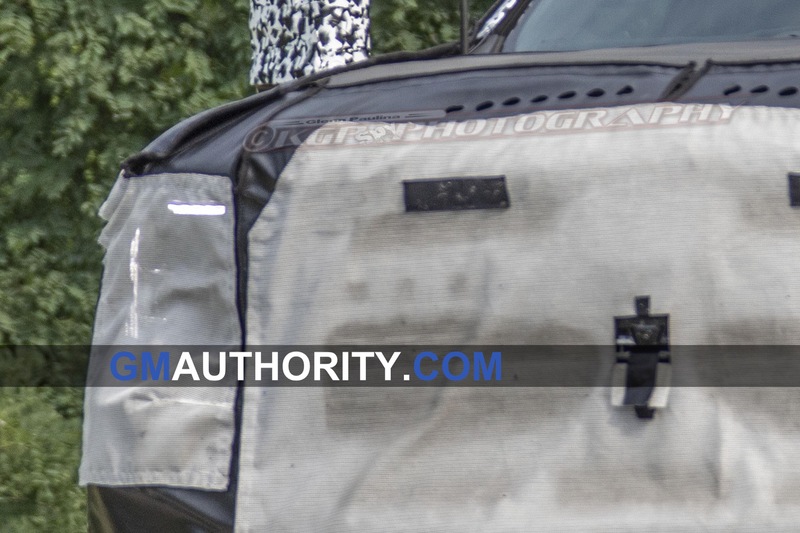 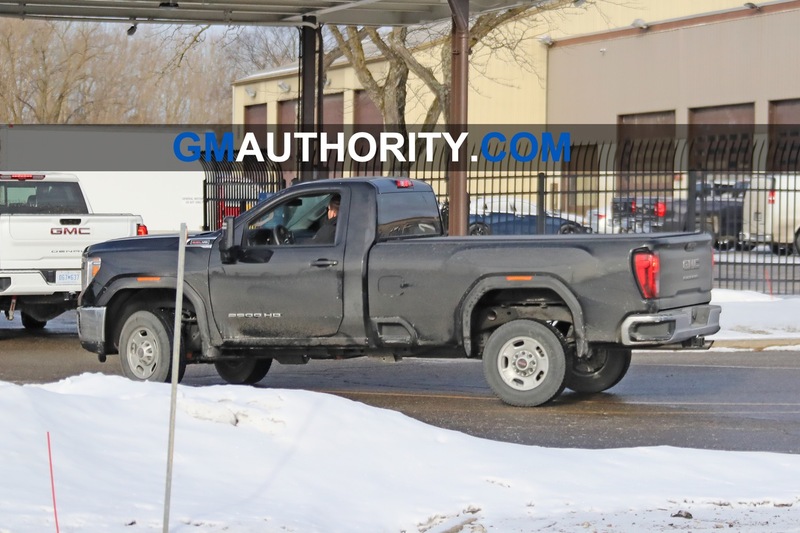 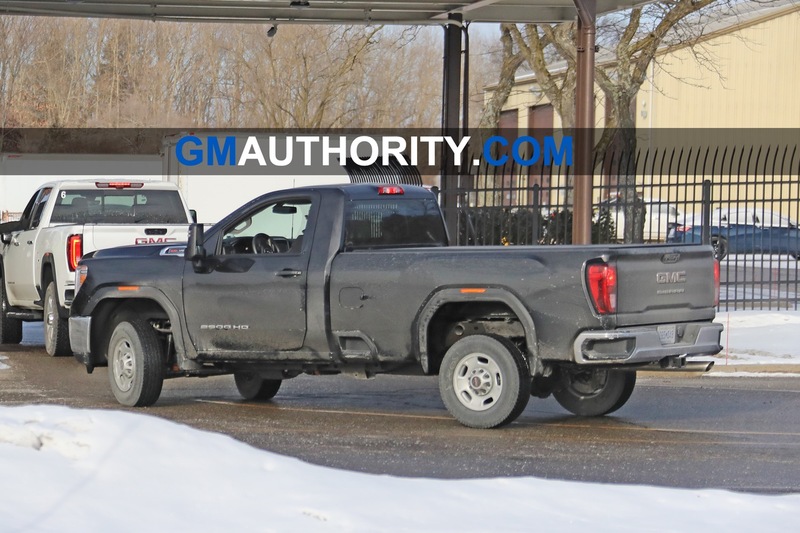 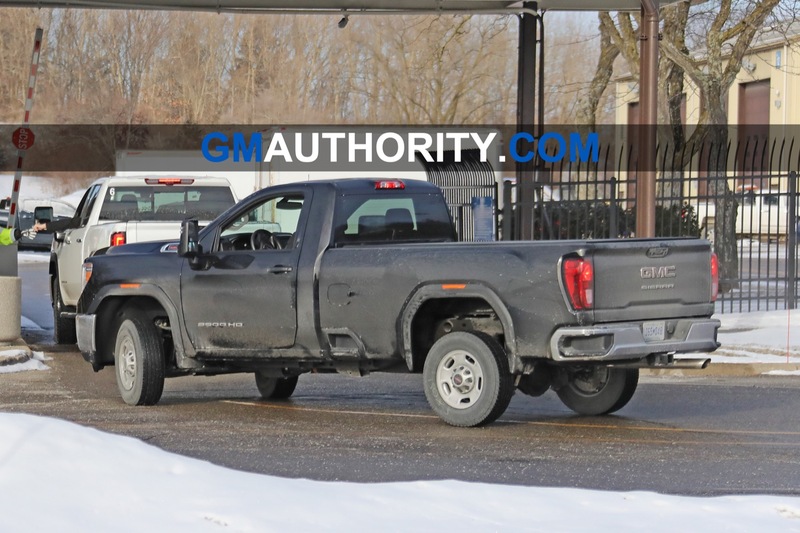 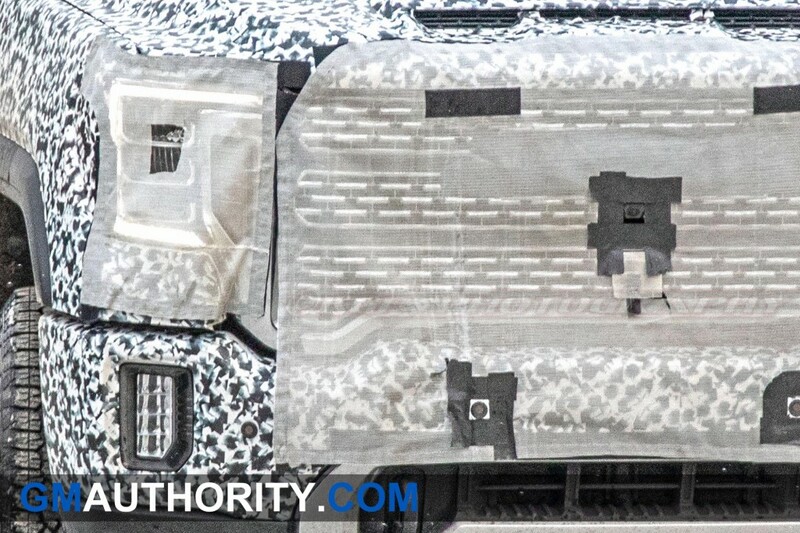 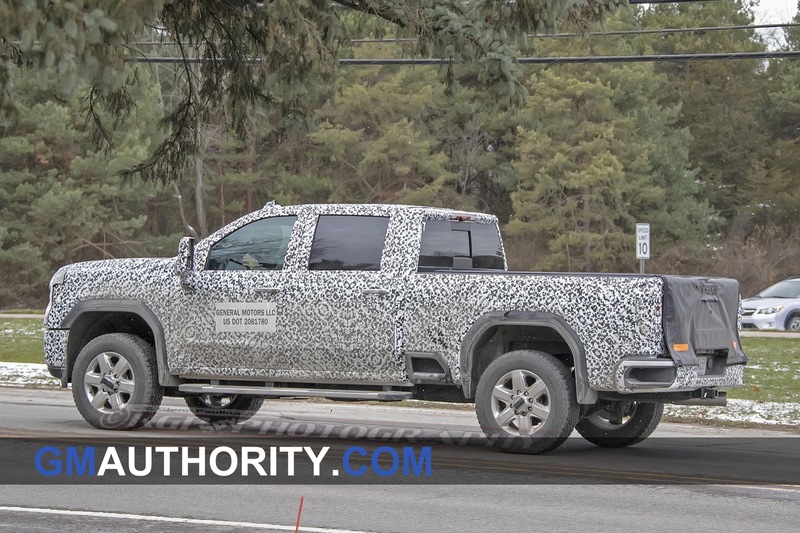 Just a few days ago, we spied the 2020 Silverado HD undergoing testing with minimal camo. 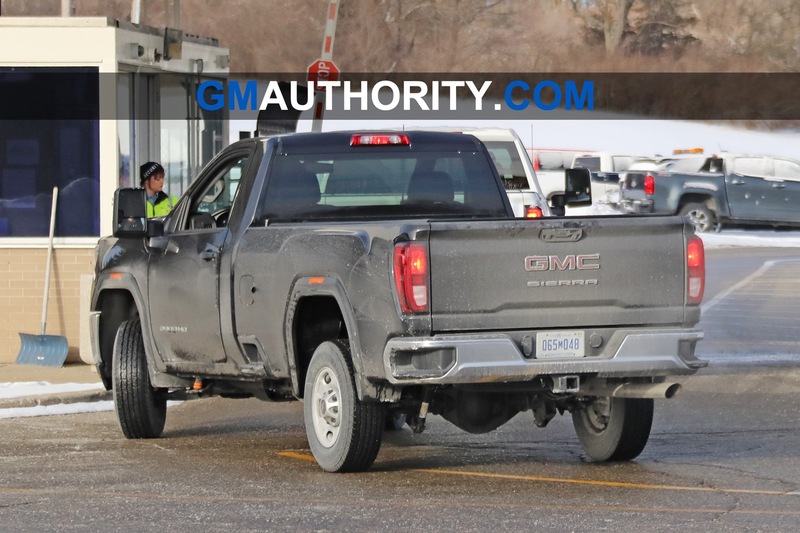 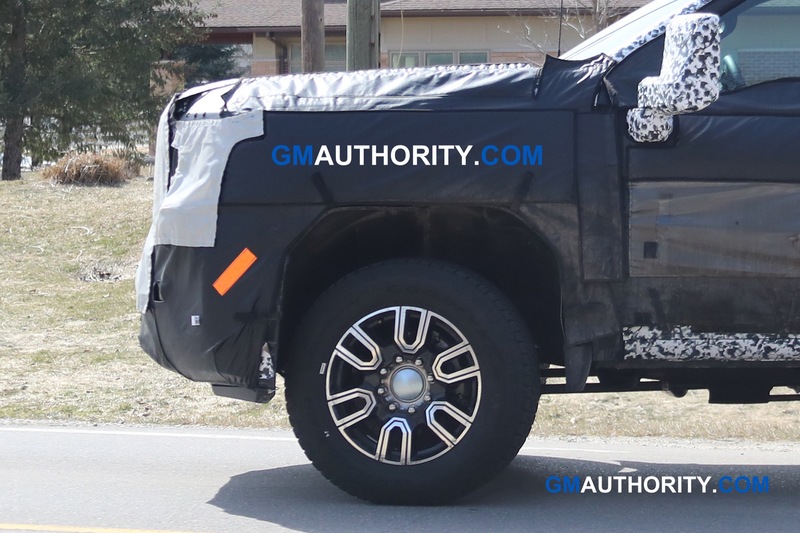 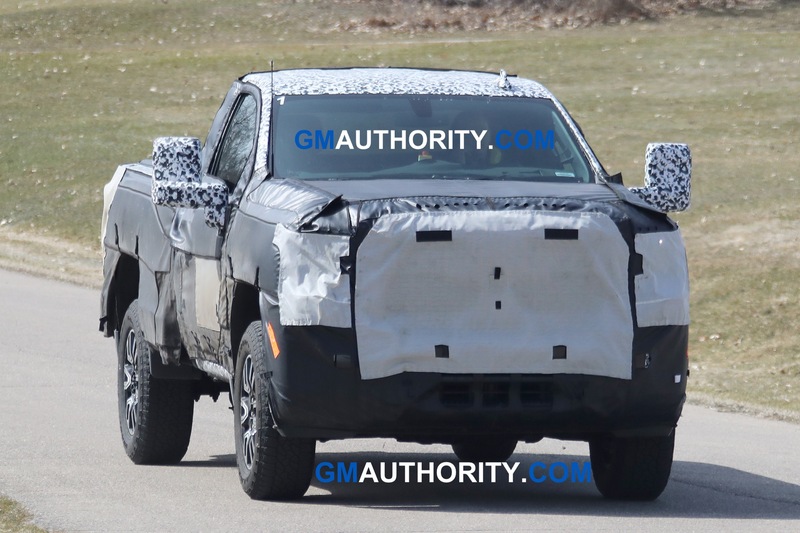 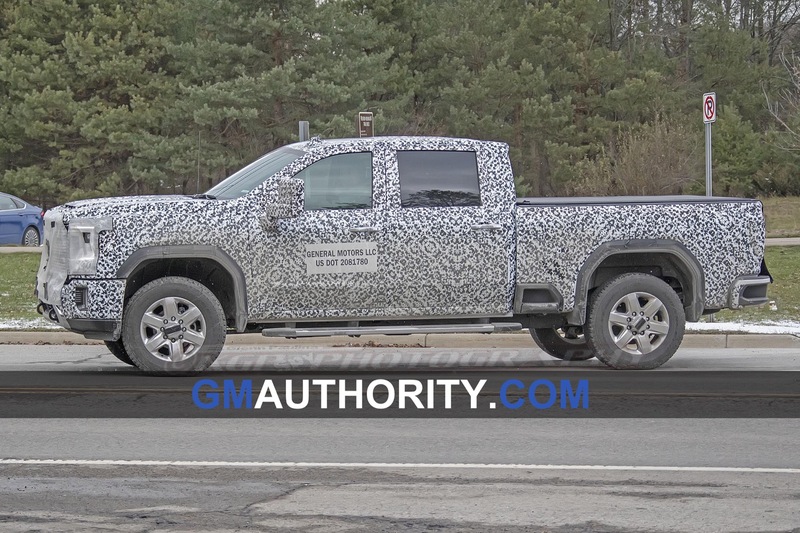 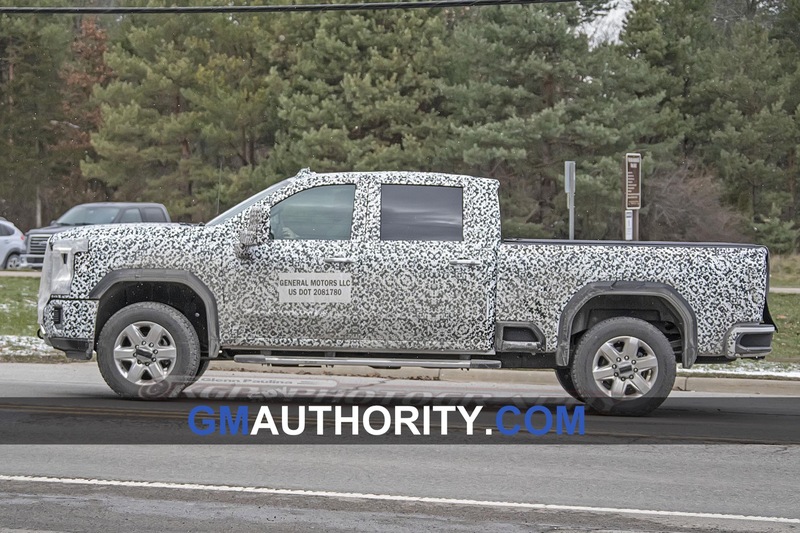 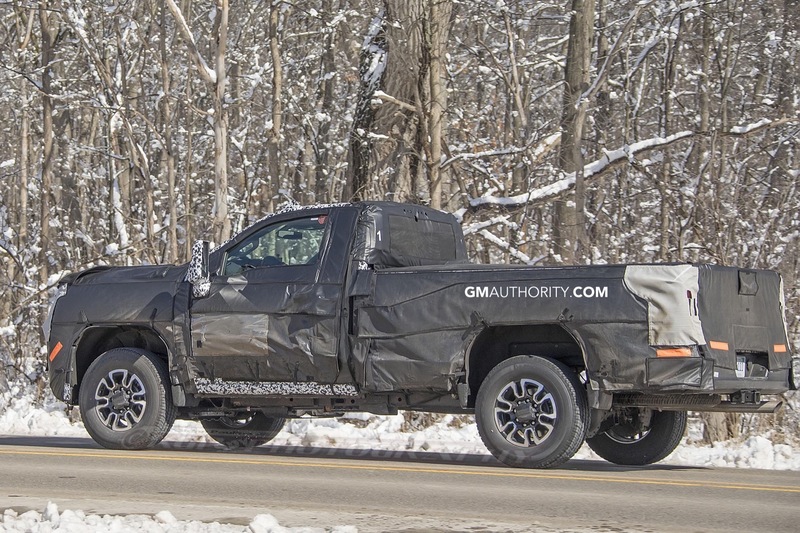 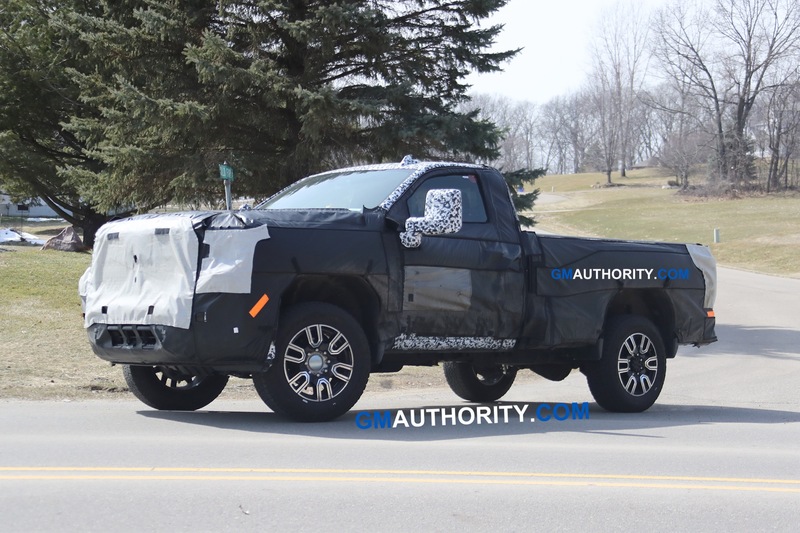 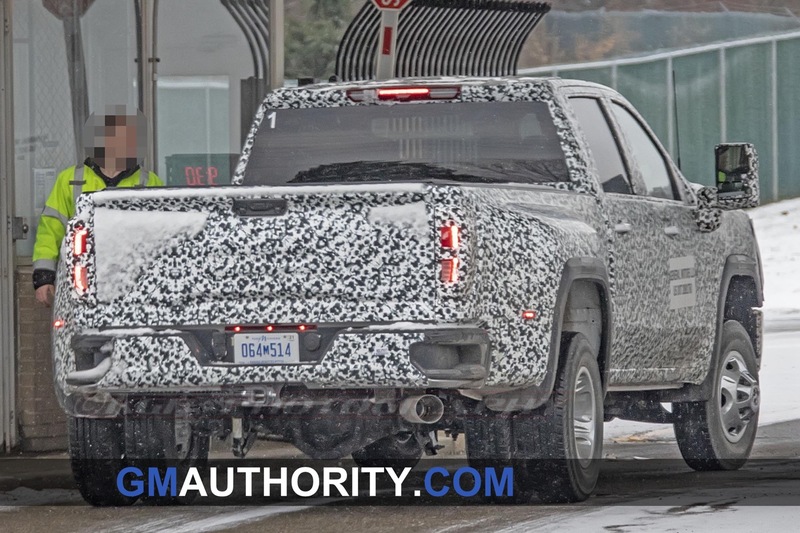 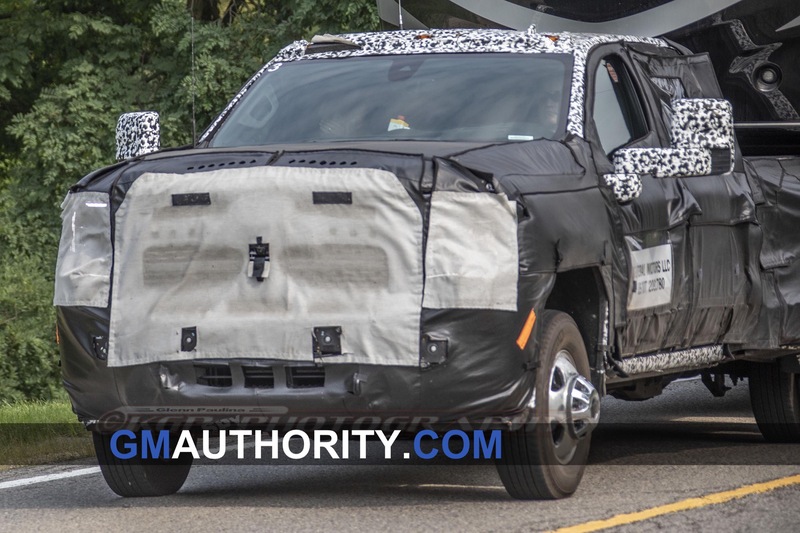 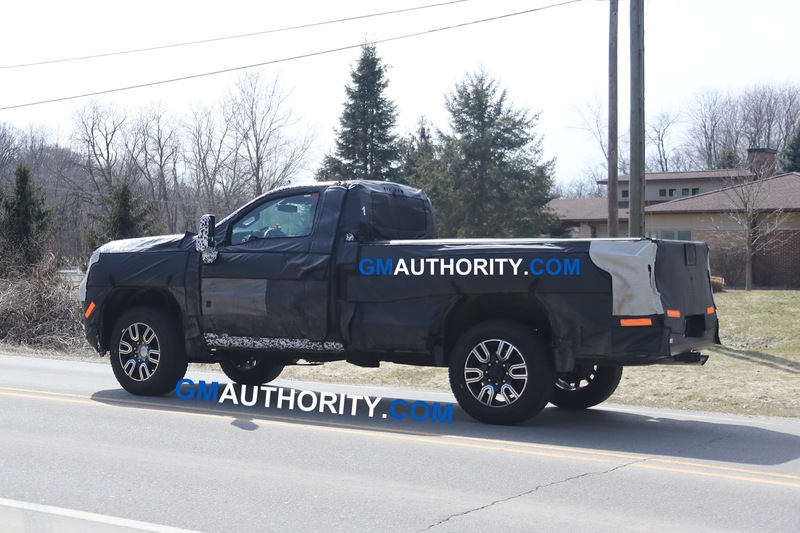 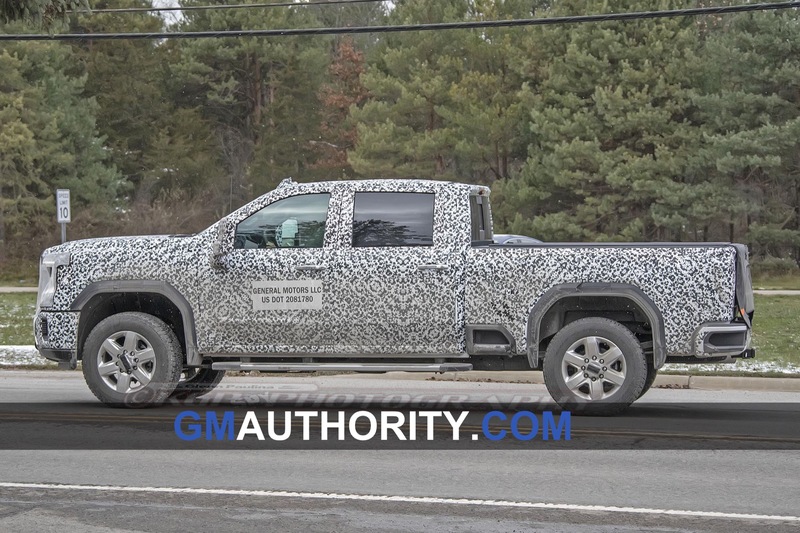 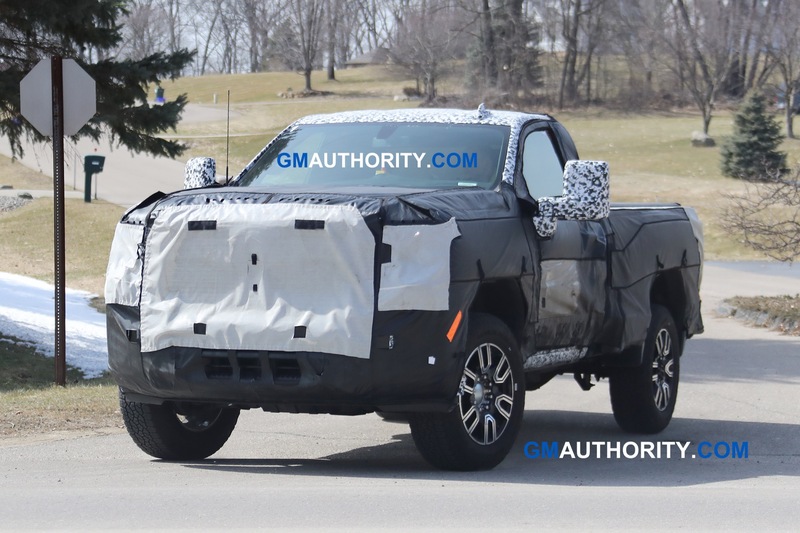 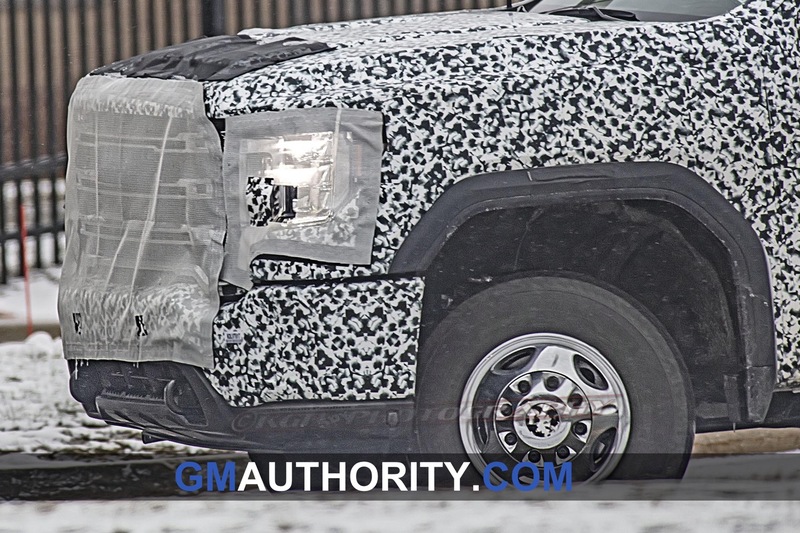 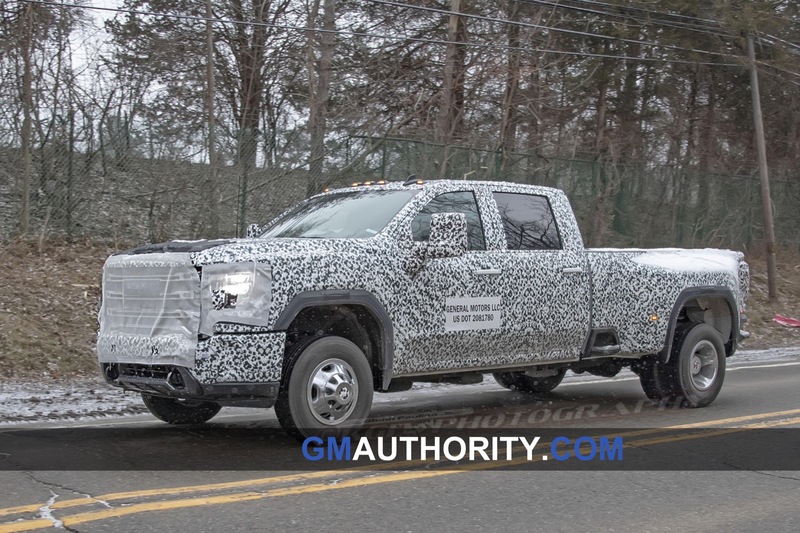 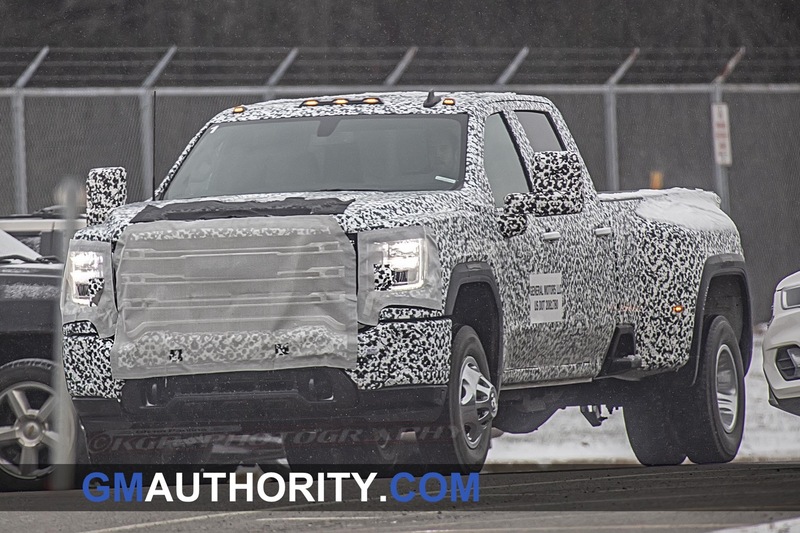 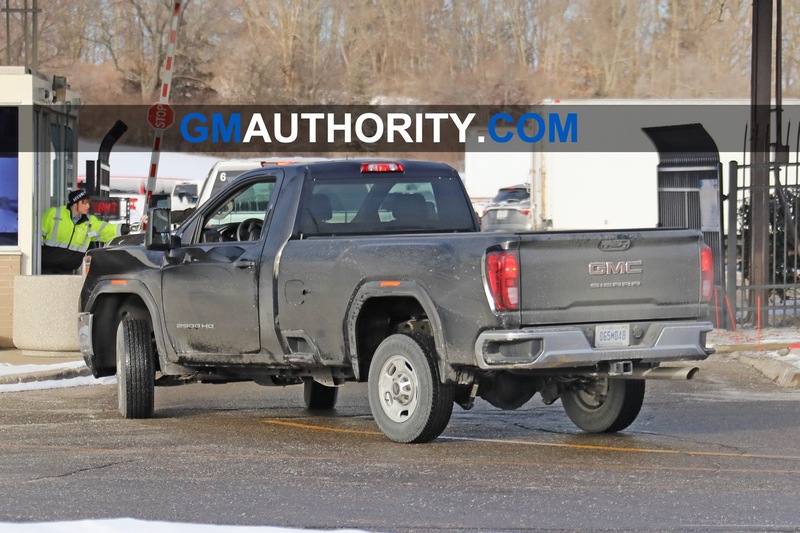 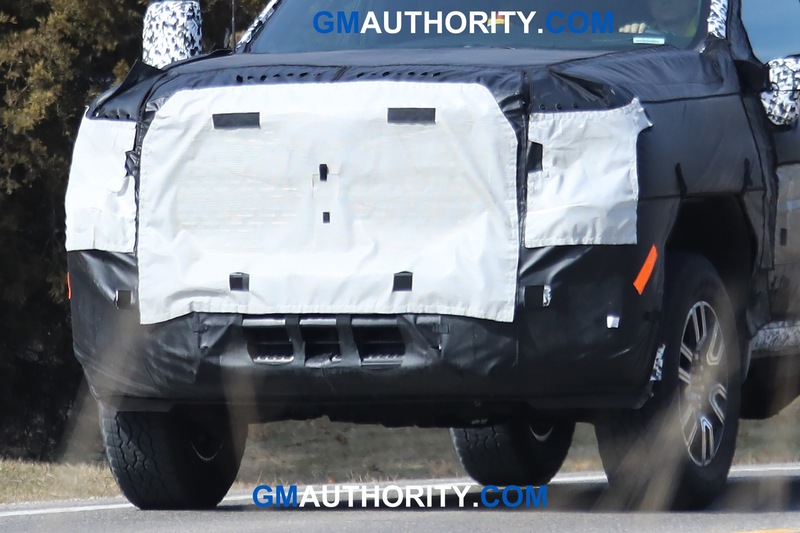 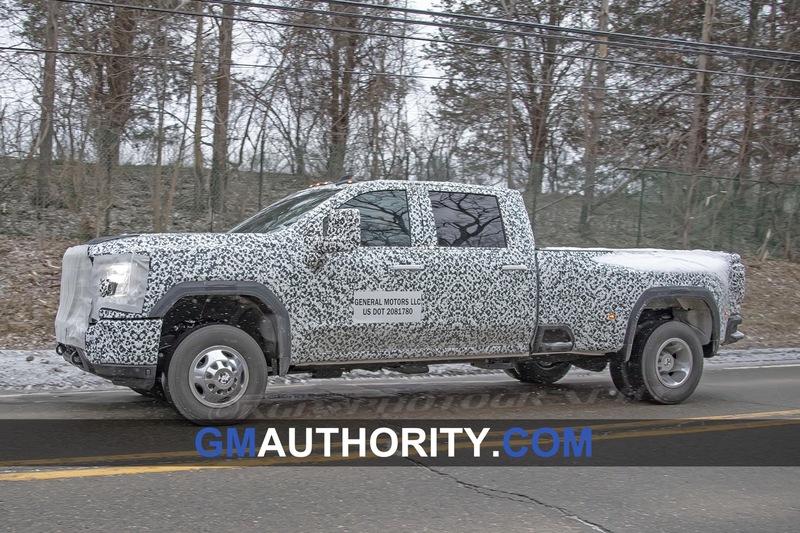 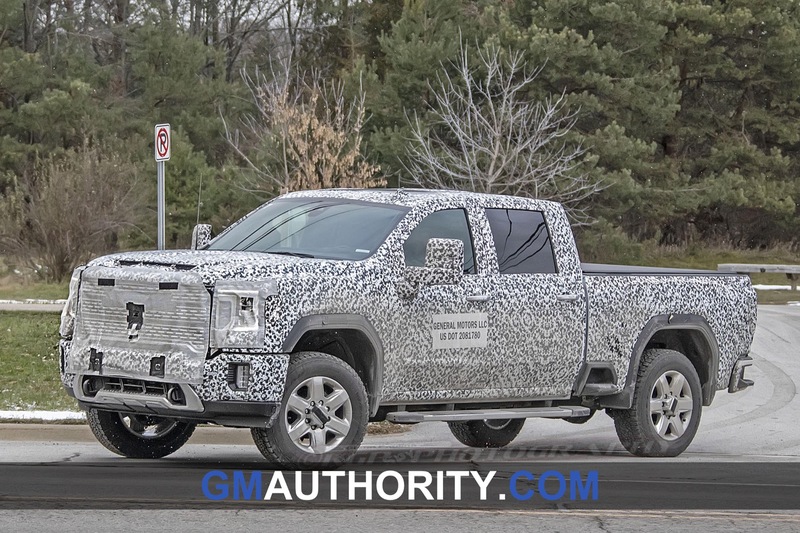 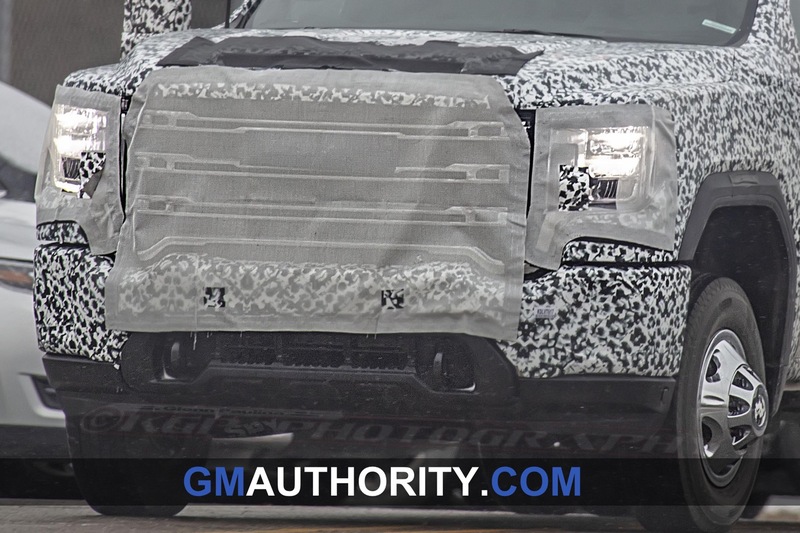 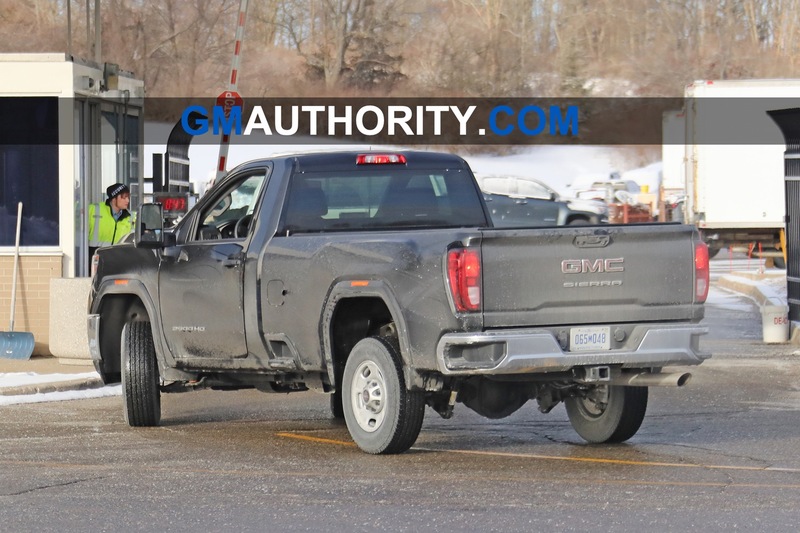 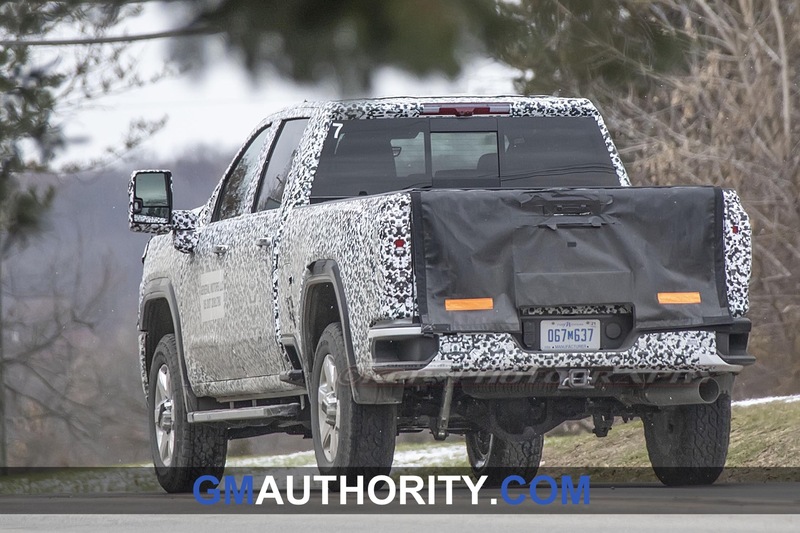 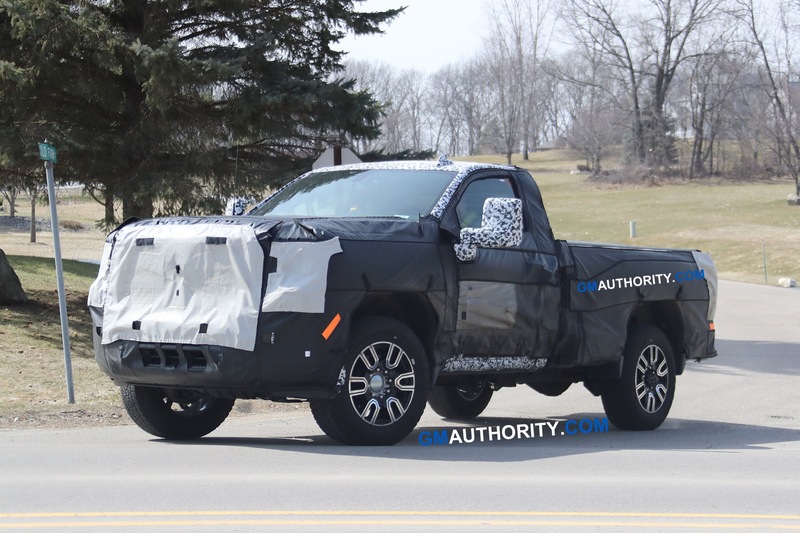 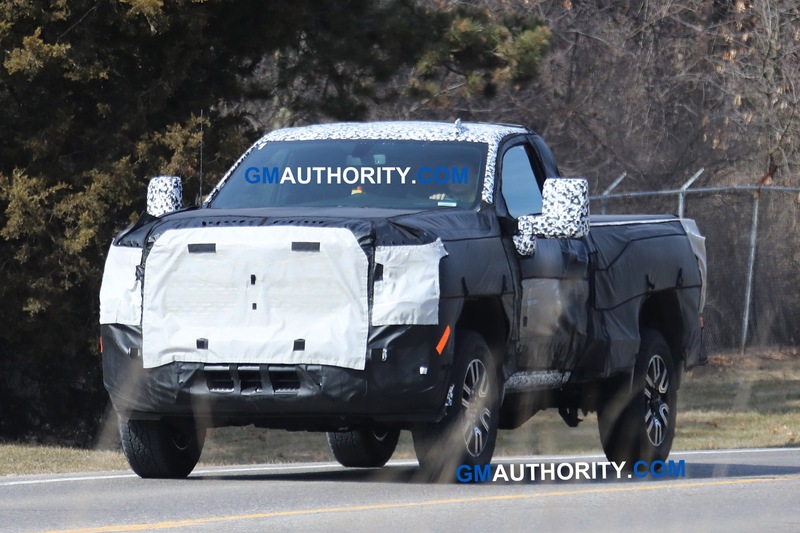 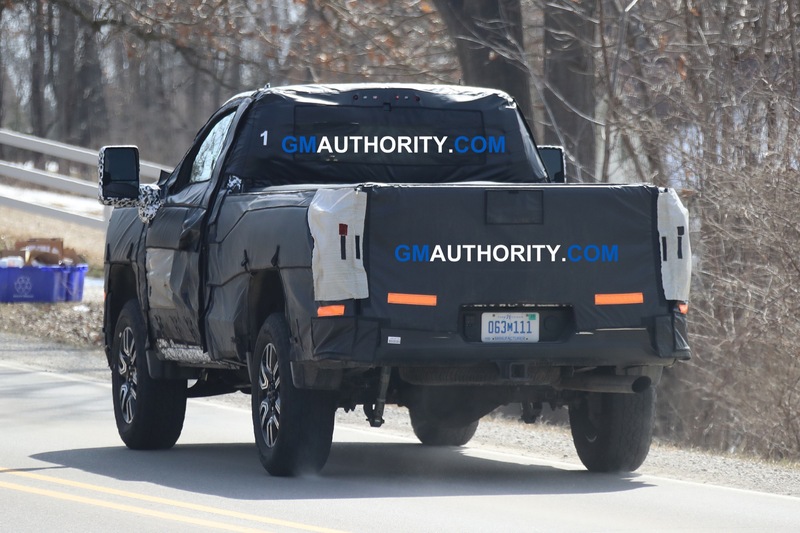 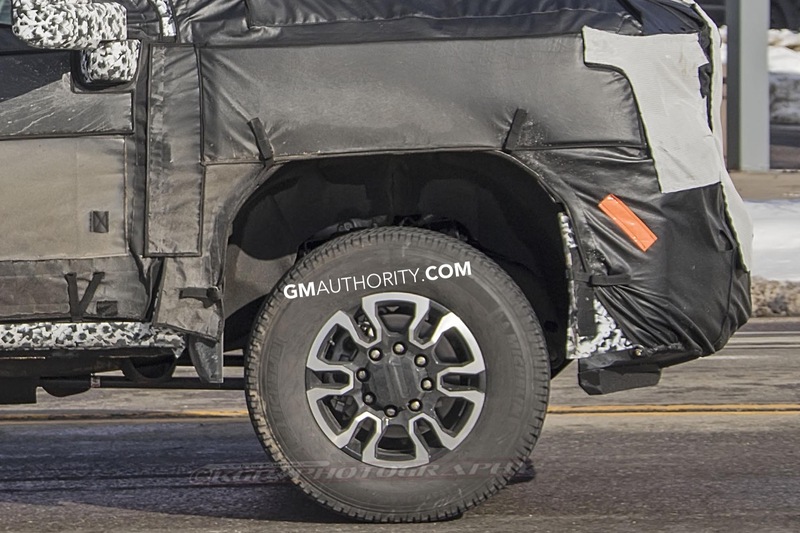 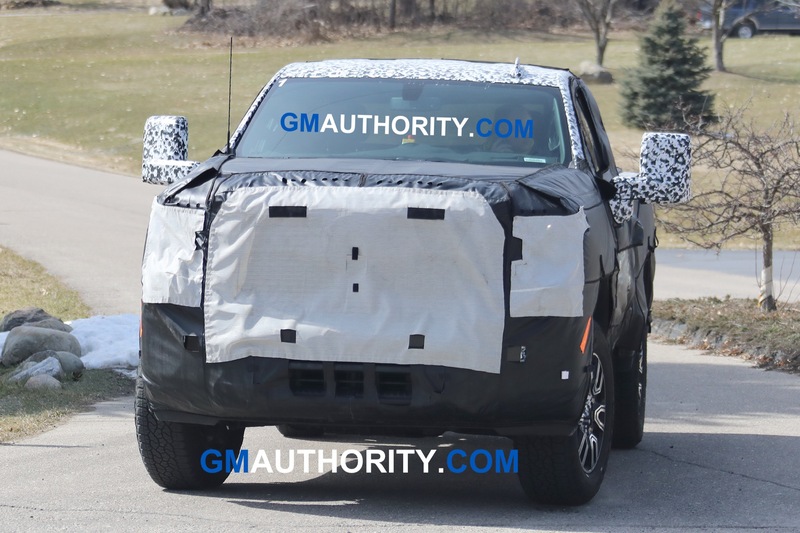 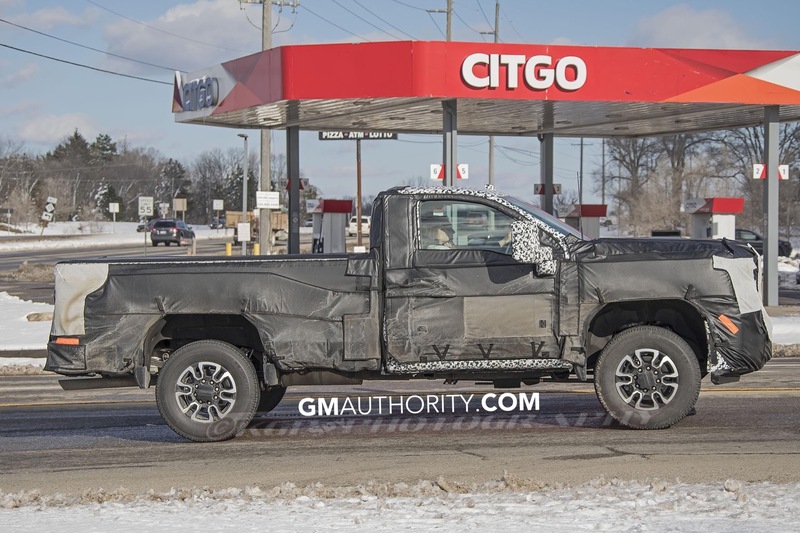 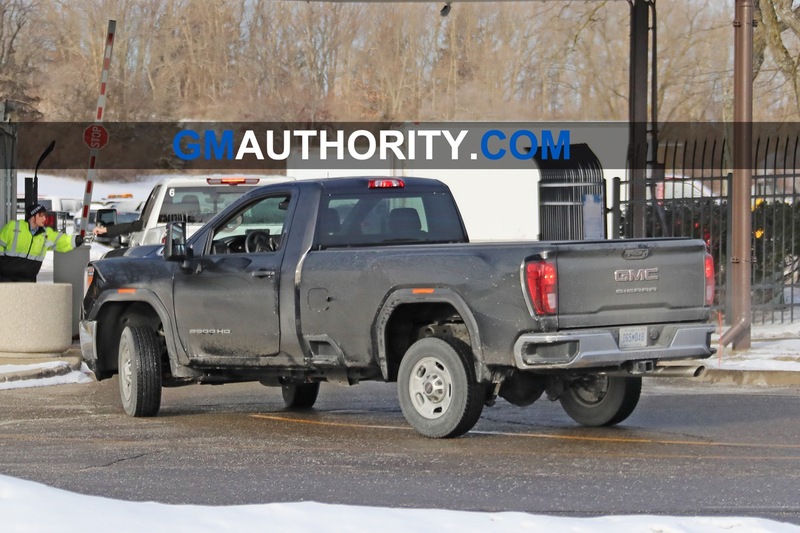 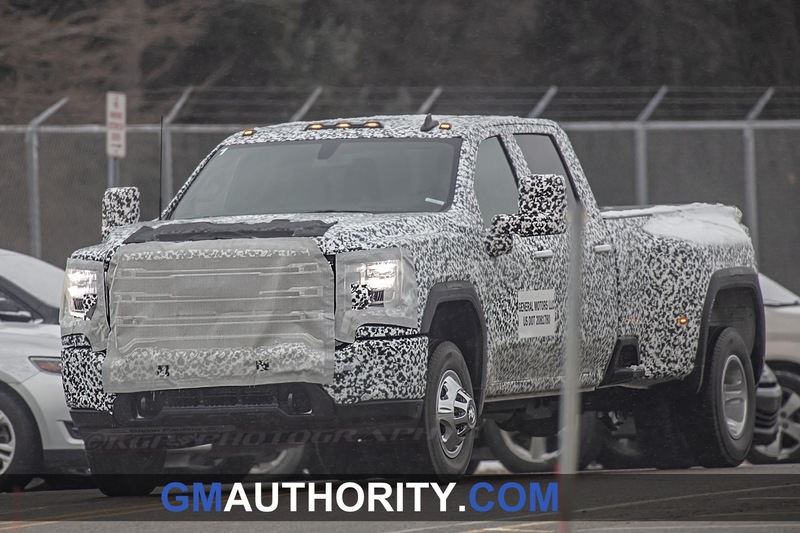 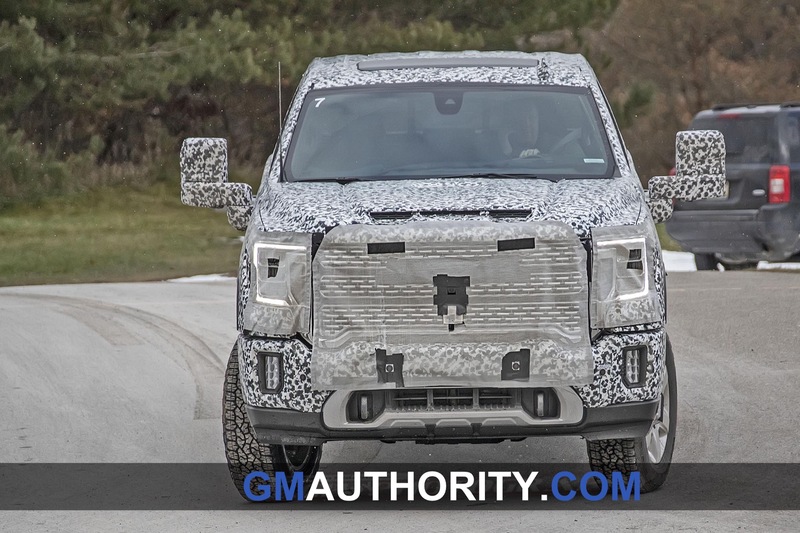 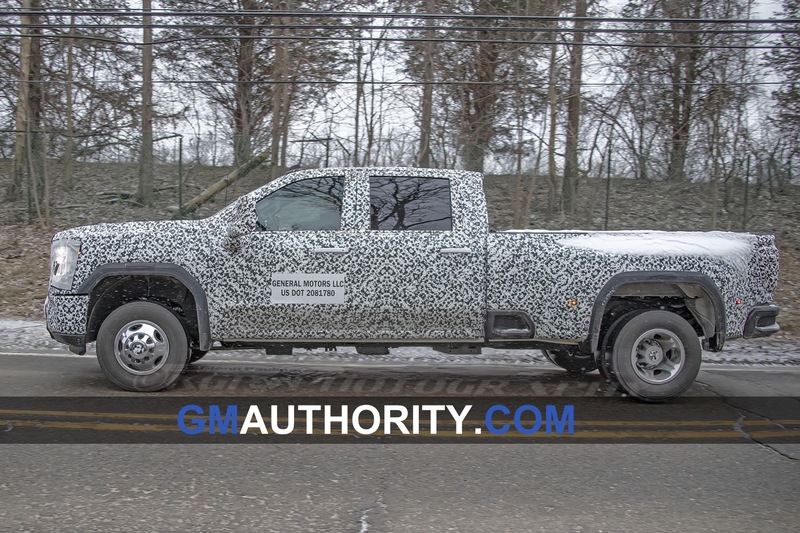 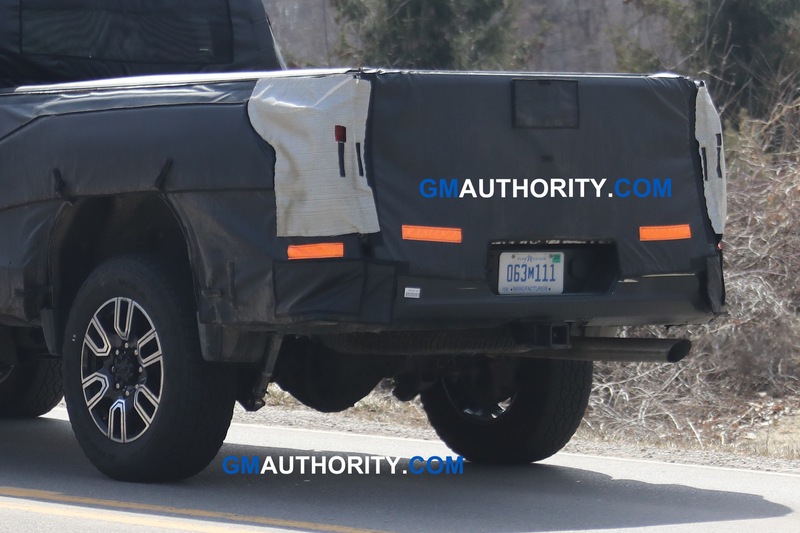 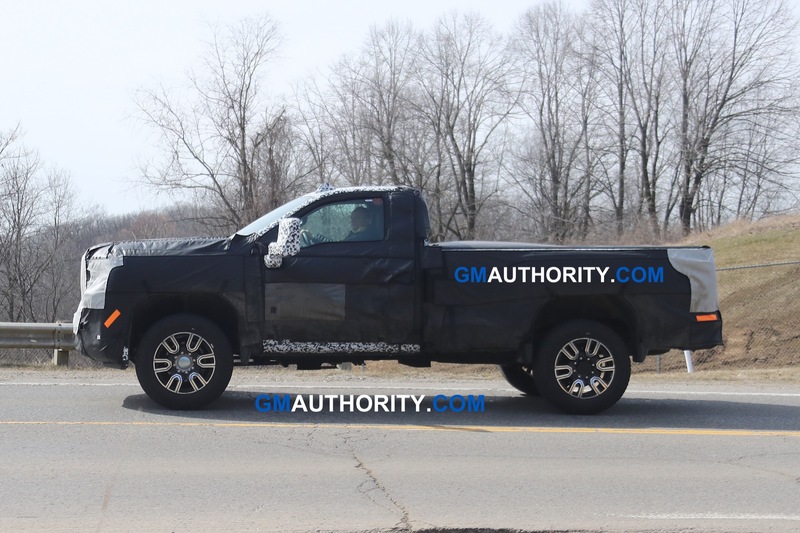 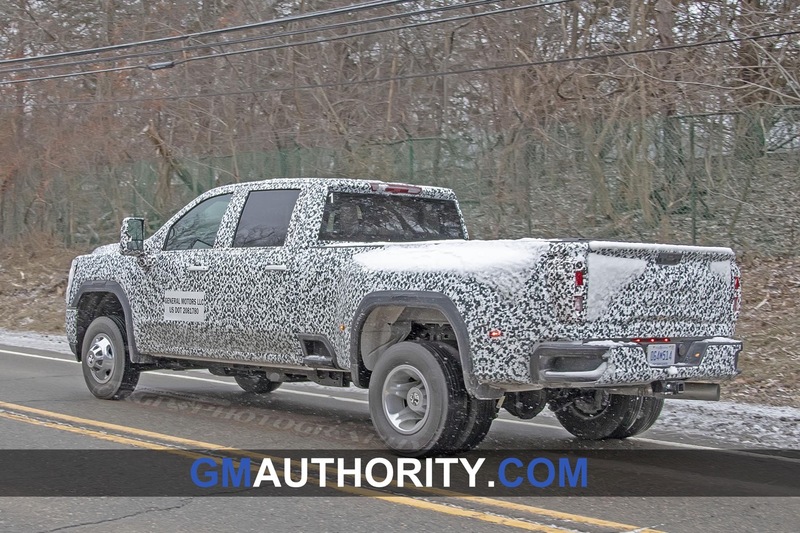 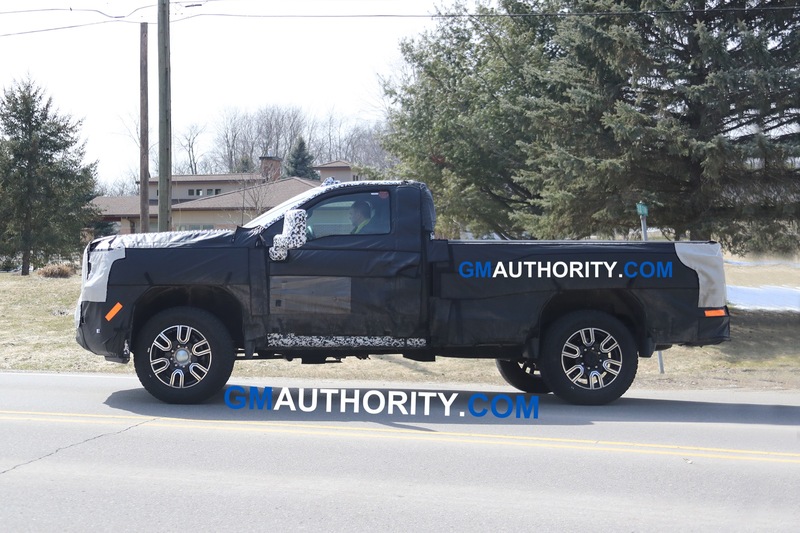 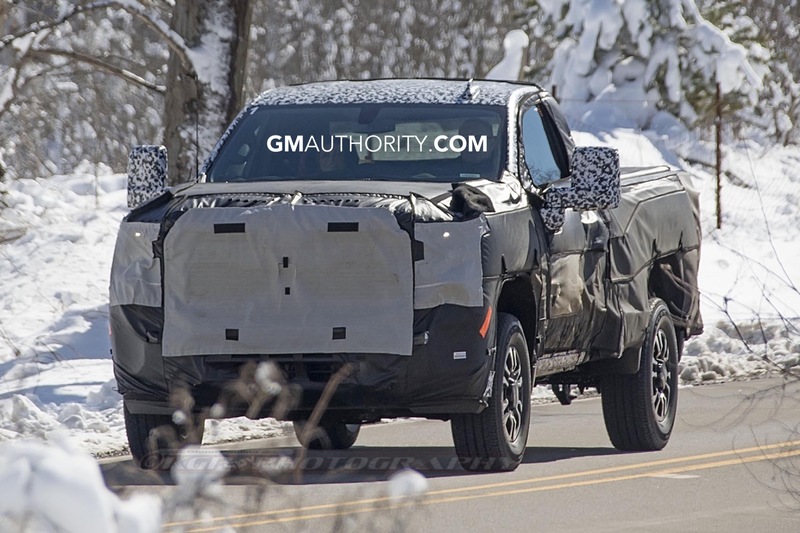 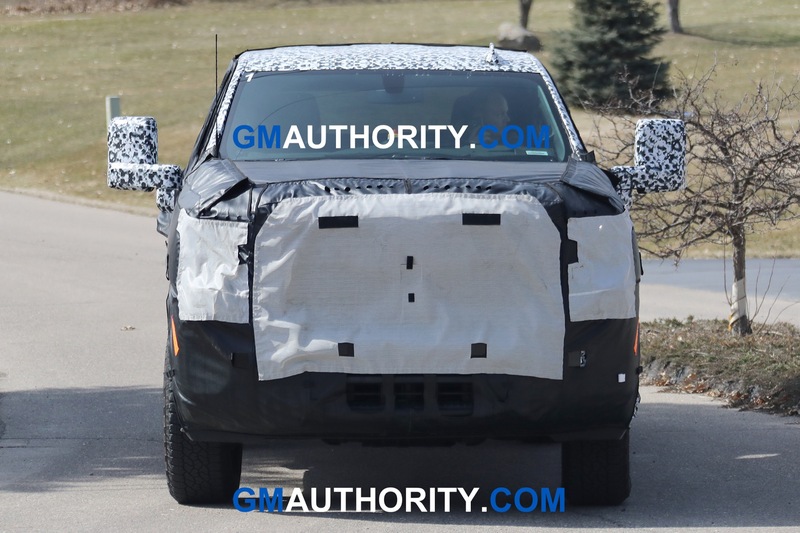 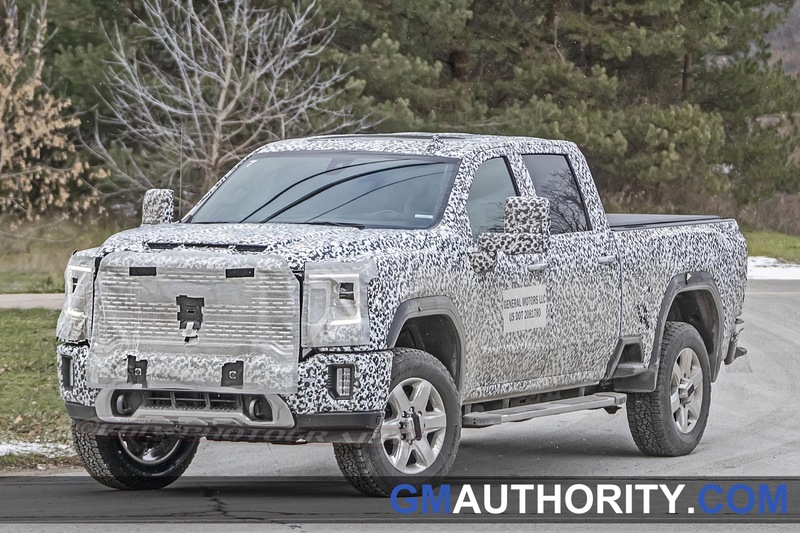 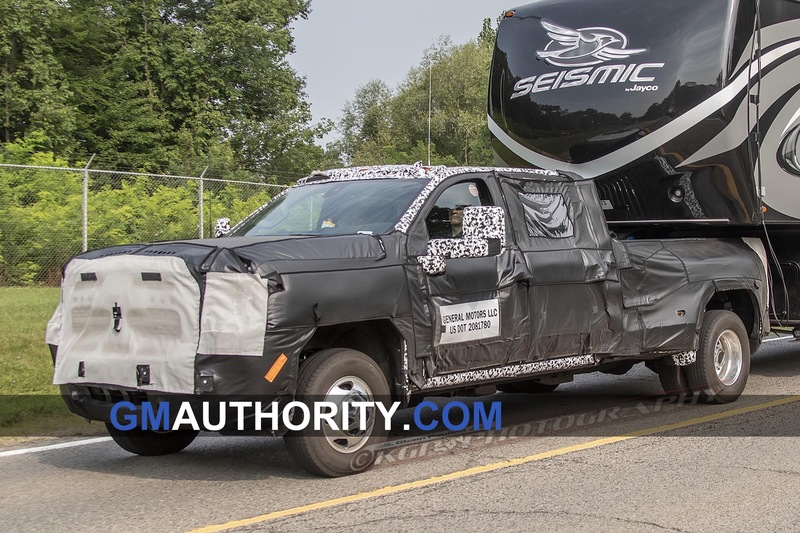 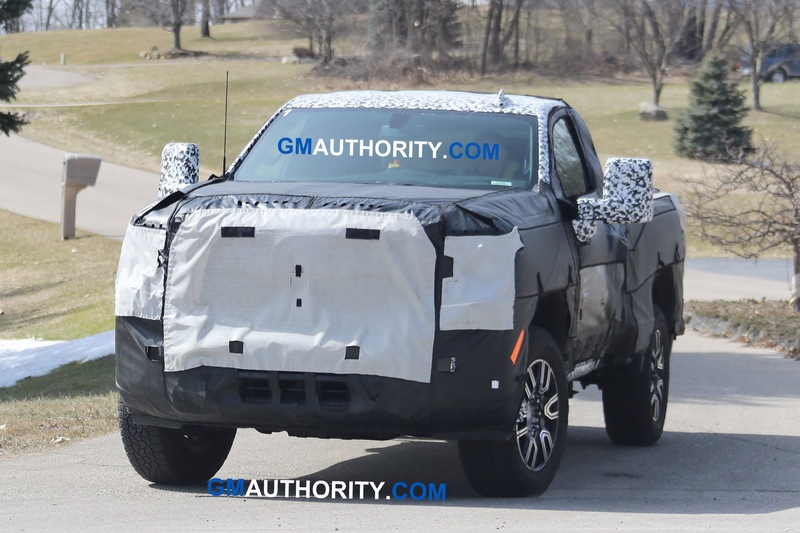 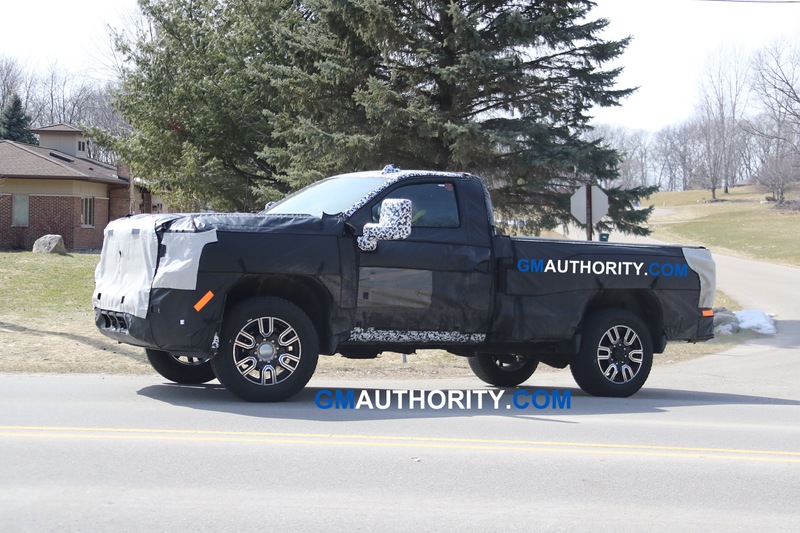 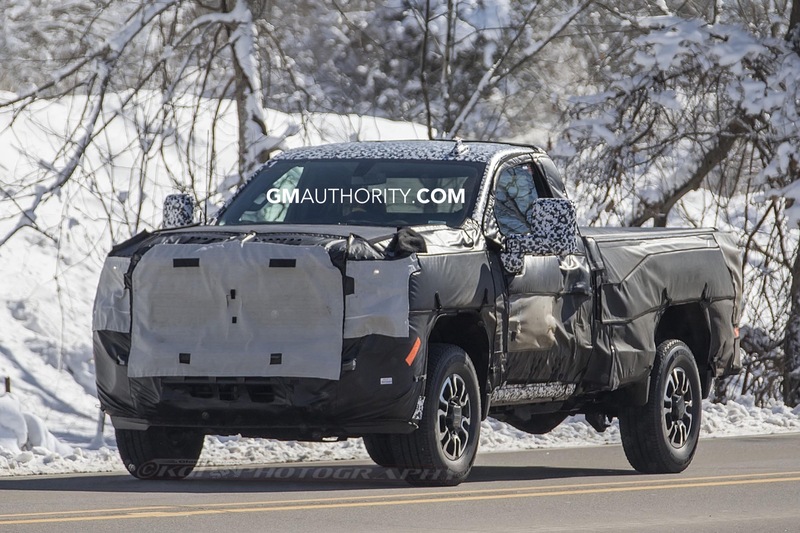 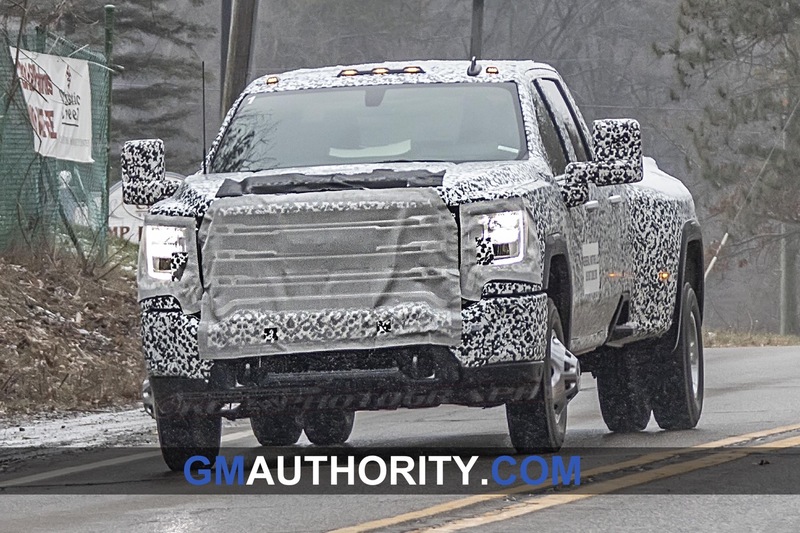 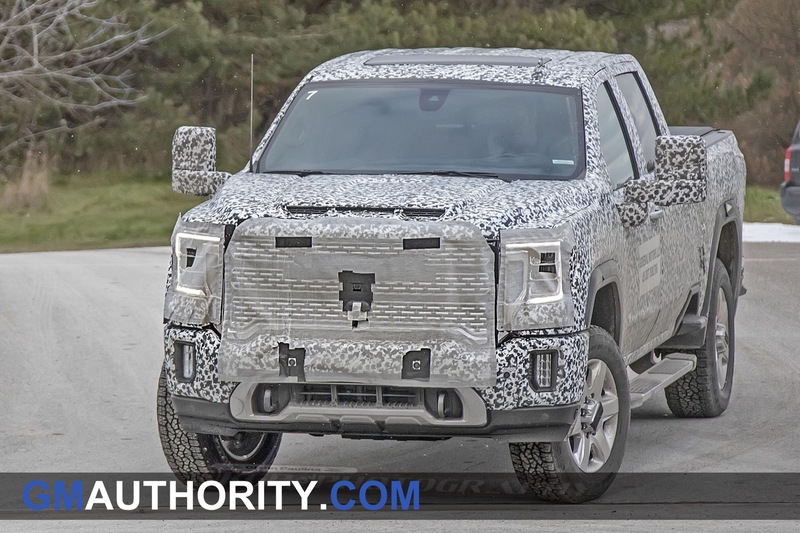 And now, we have gotten our hands on equally-revealing spy pictures of the 2020 GMC Sierra HD as it was undergoing testing on public Michigan roads, swapping the heavy vinyl camo in favor of a tight-fitting body wrap. 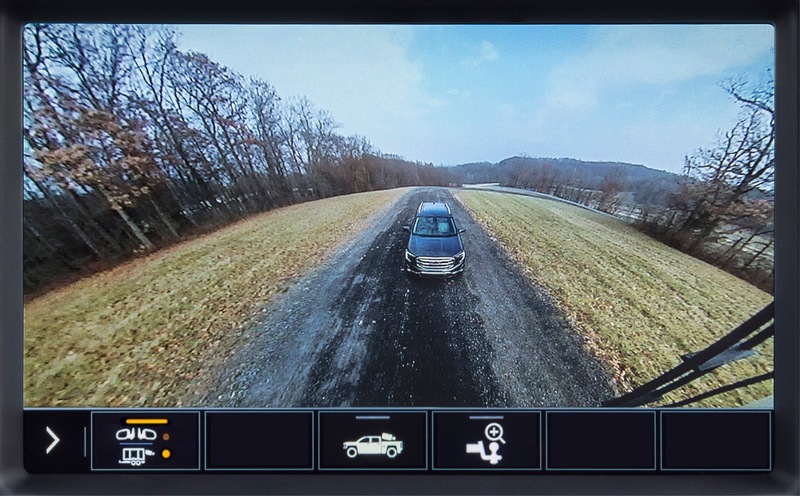 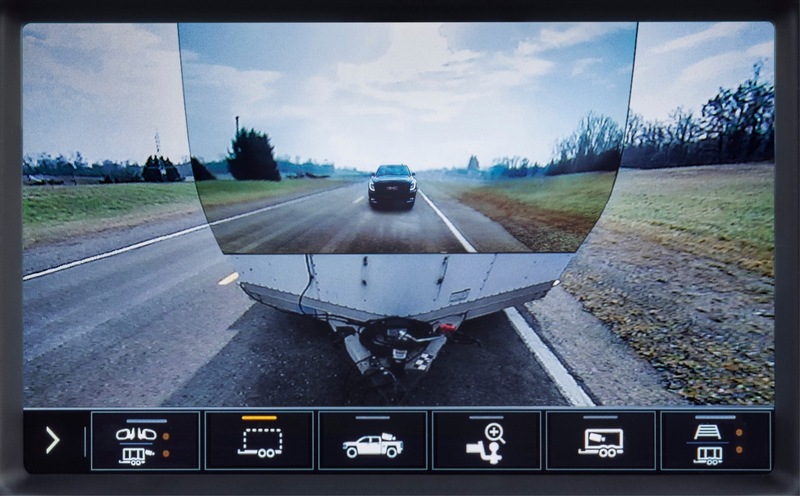 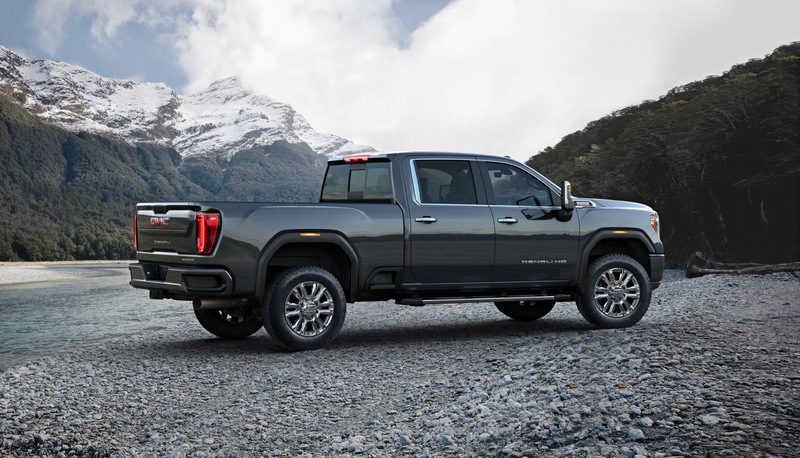 The shots show the range-topping Sierra Denali and reveal its front end design, including the headlight and grille treatments as being highly similar to its 2019 Sierra 1500 light-duty brother. 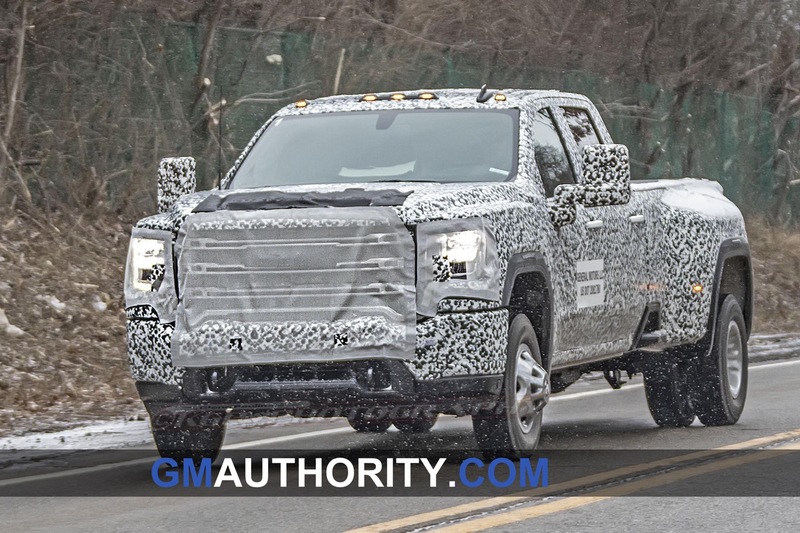 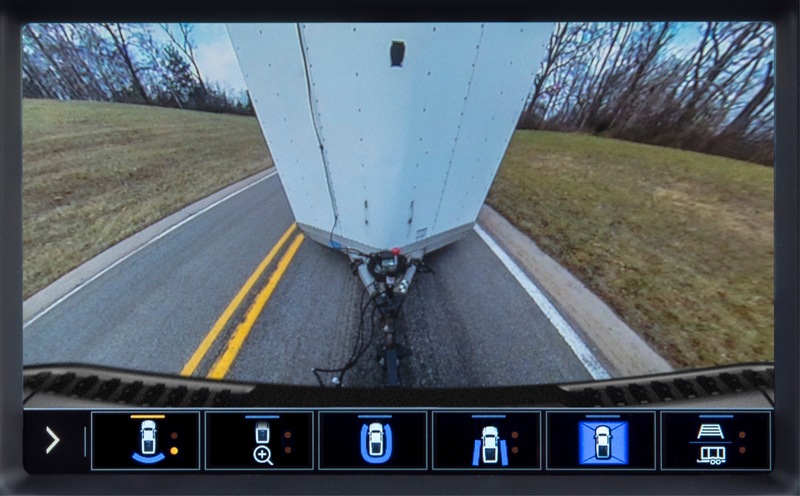 Specifically, the 2020 Sierra HD has similar C-shaped lighting signatures within a full-LED primary headlight cluster. 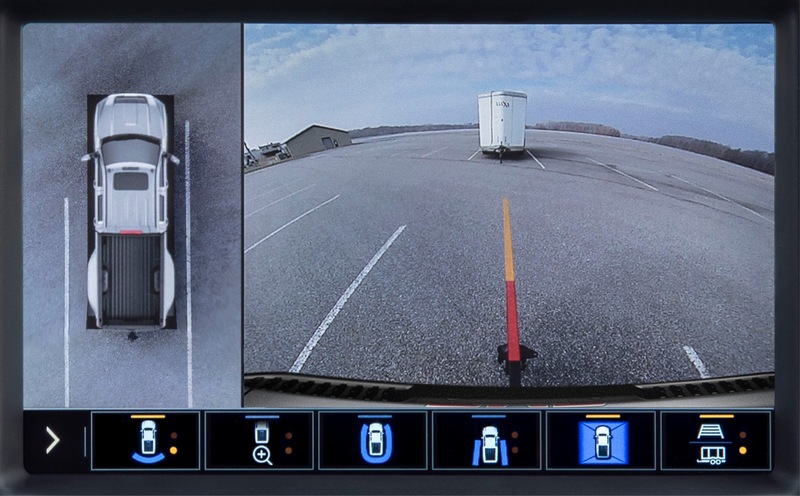 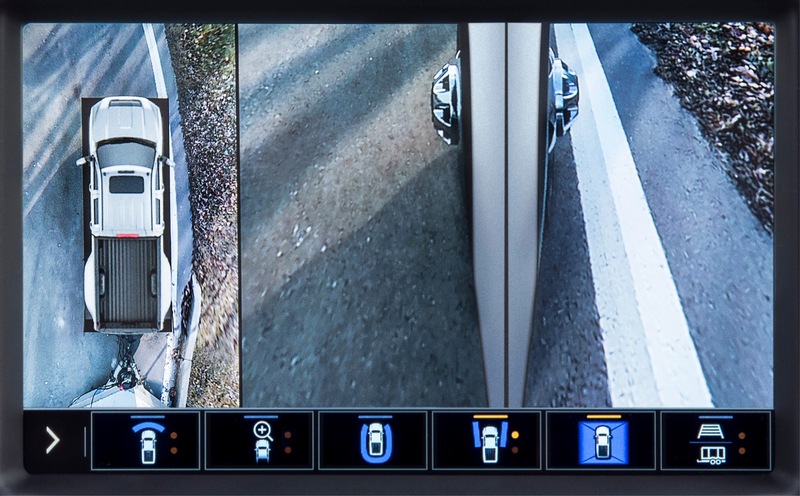 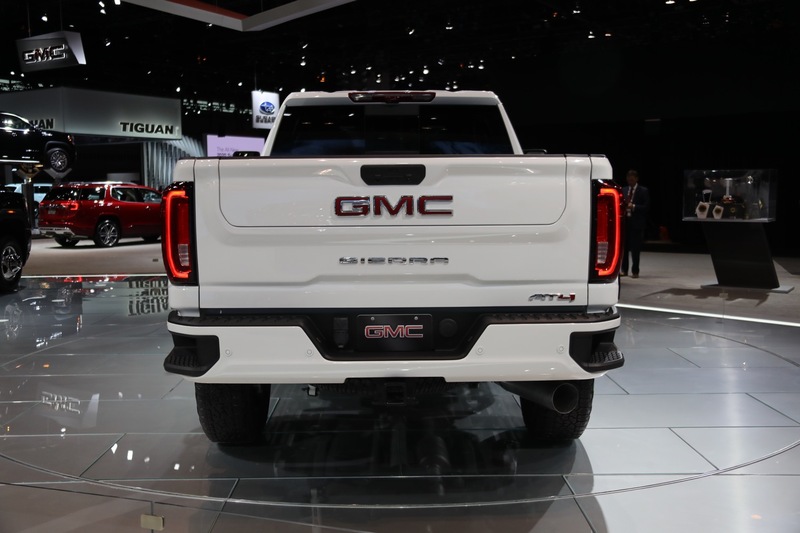 The LED fog lights – mounted below – are nearly identical to the units on the new Sierra 1500. There’s also a large chrome grille separating the headlights. 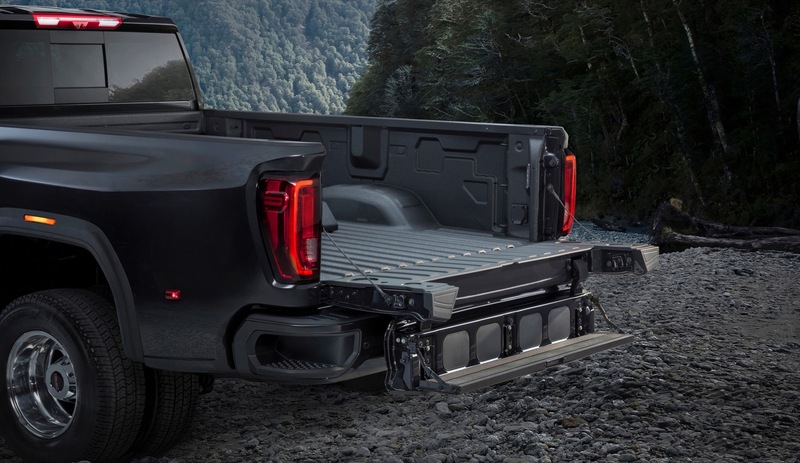 That said, all of these elements seem bolder and chunkier than the ones on the 2019 Sierra 1500. 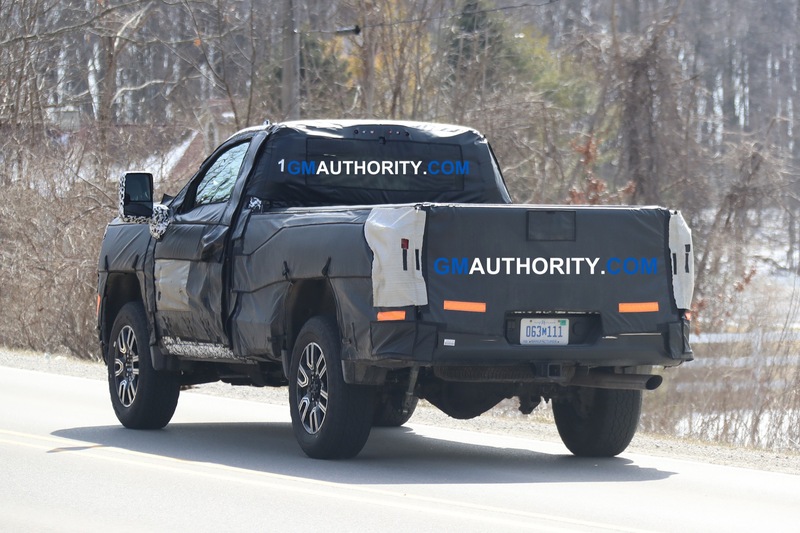 Also take note of the horizontal front air intake mounted on the hood. 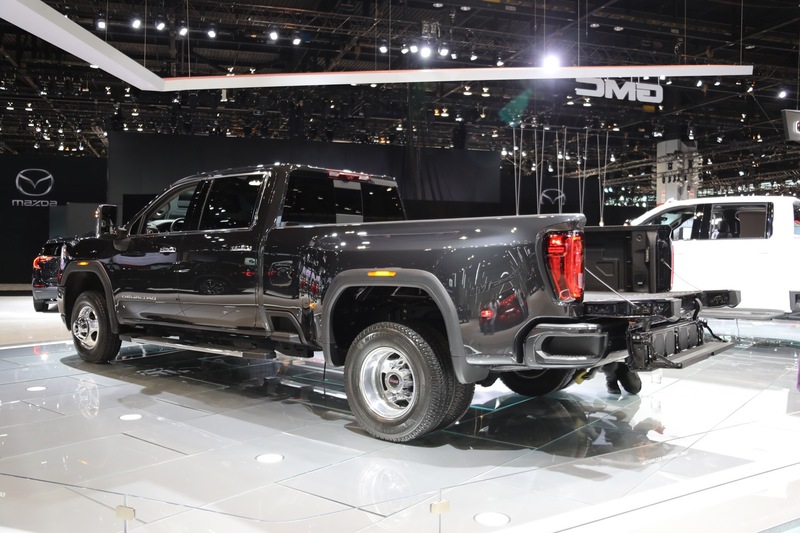 The functional intake was introduced for the 2017 Sierra HD as a way to help the new 6.6L Duramax L5P motor breathe better. 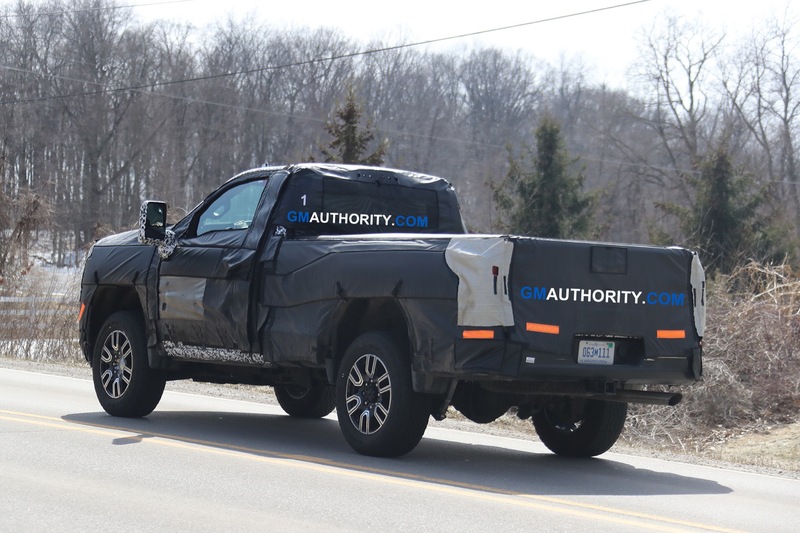 In addition, the cab has a bolder, more upright shape than the current K2-based models. 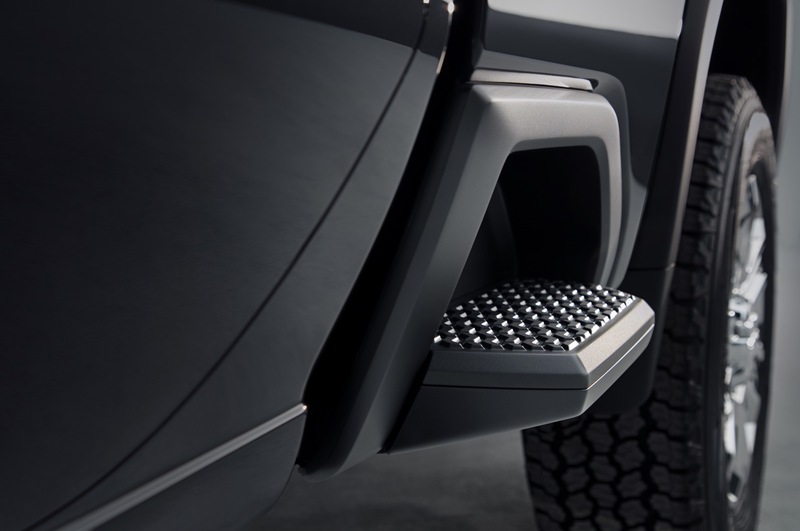 Meanwhile, the box gets an integrated bed step just behind the cab (aft of the rear wheel). 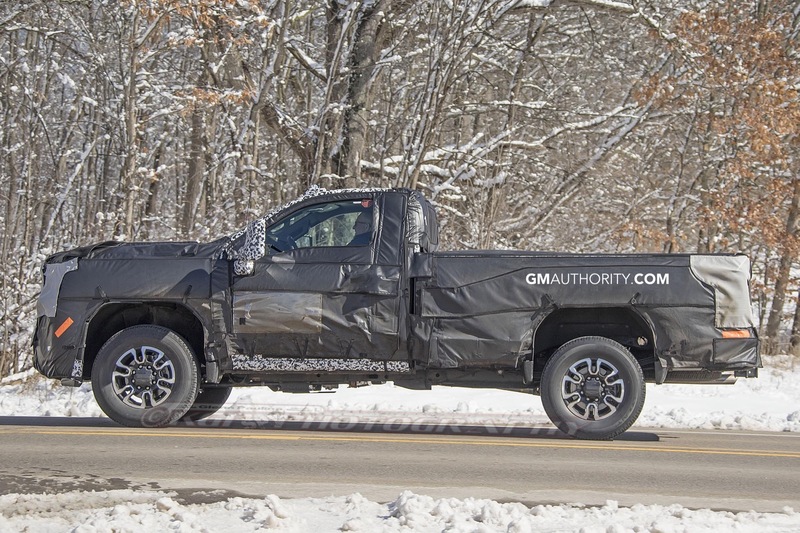 GM Authority was first to spotlight the feature before the trucks dropped their heavy vinyl wrappings. 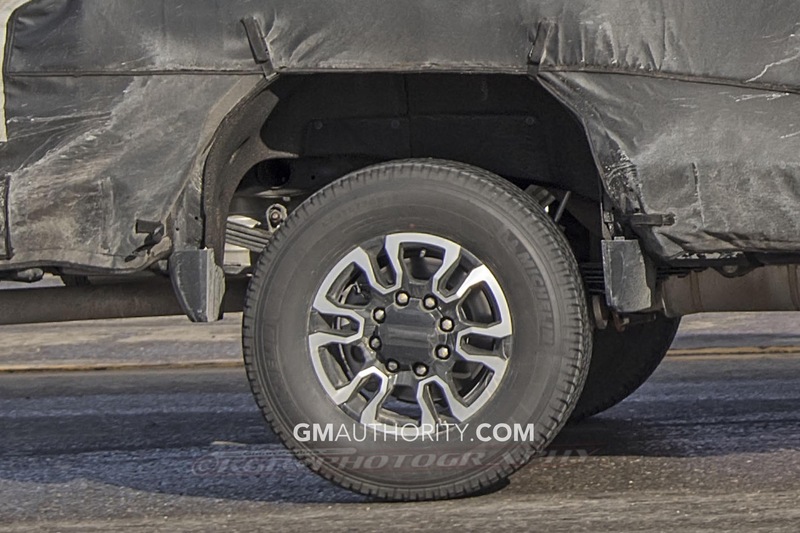 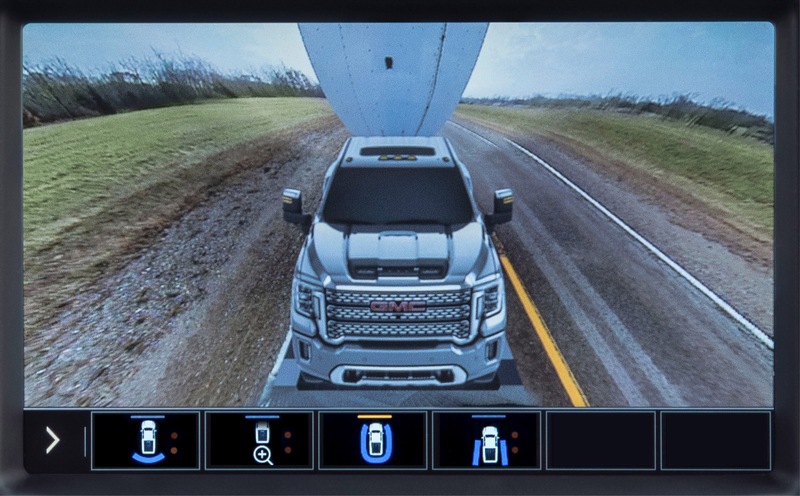 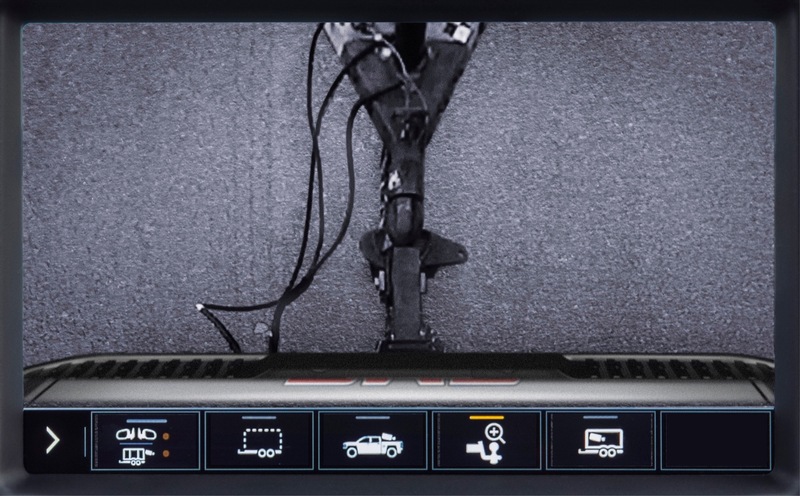 Also take note of the unique shape of the wheel wells, which are nearly identical to the units found on the 2019 Sierra 1500. 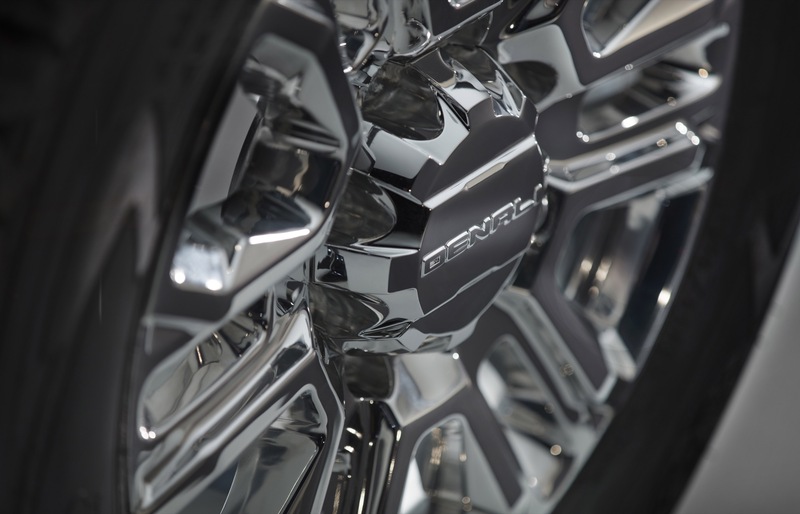 The new-generation, T1 platform Silverado features round wheel-wells. 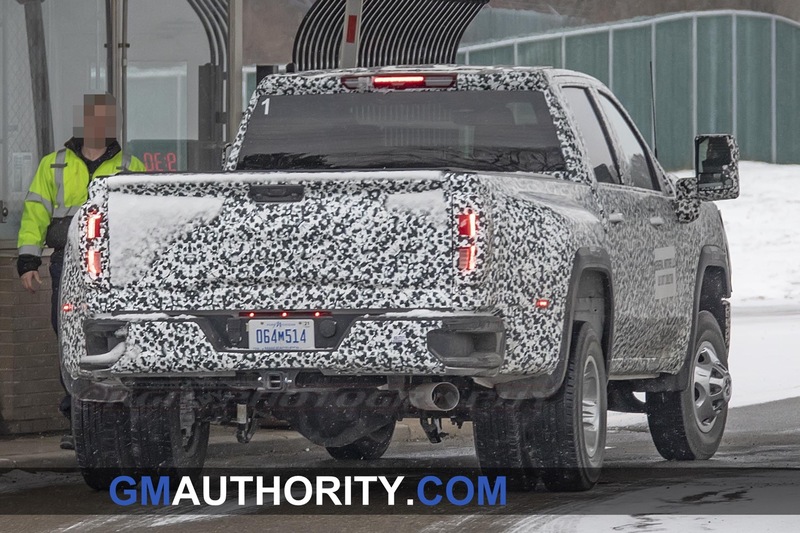 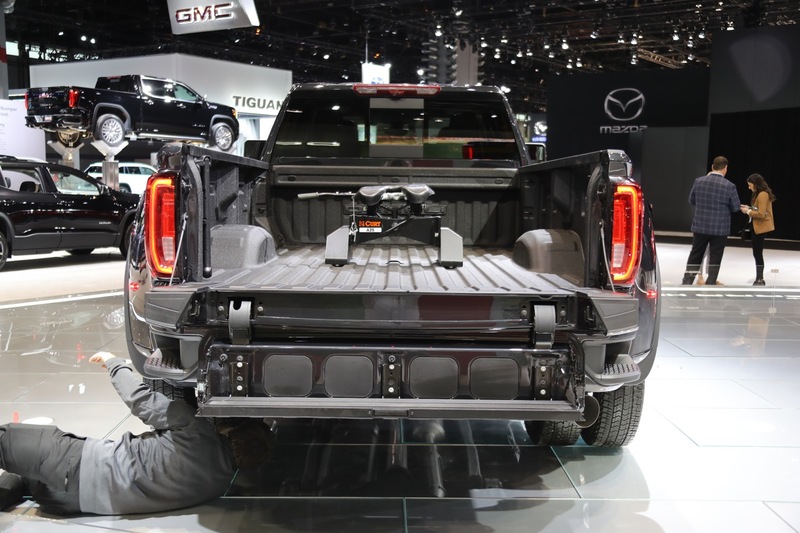 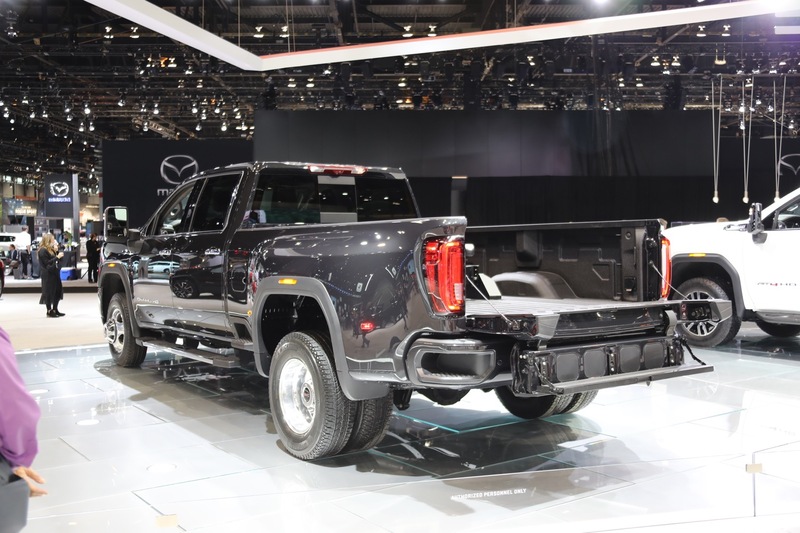 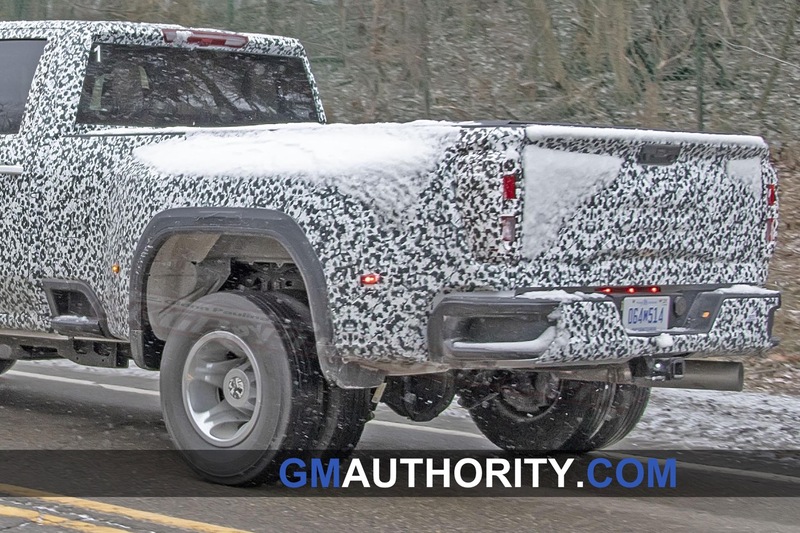 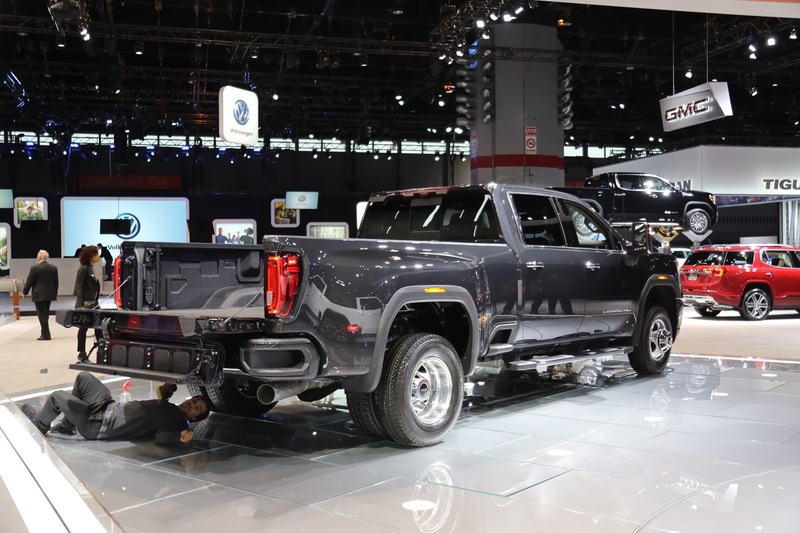 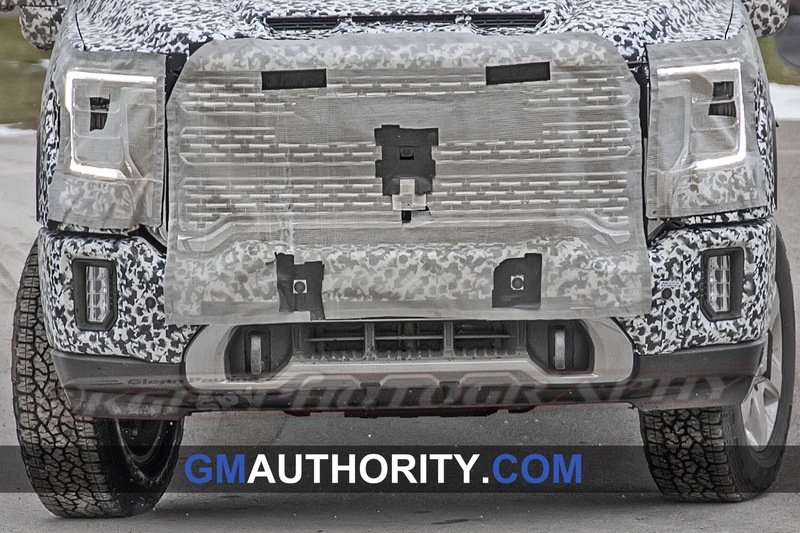 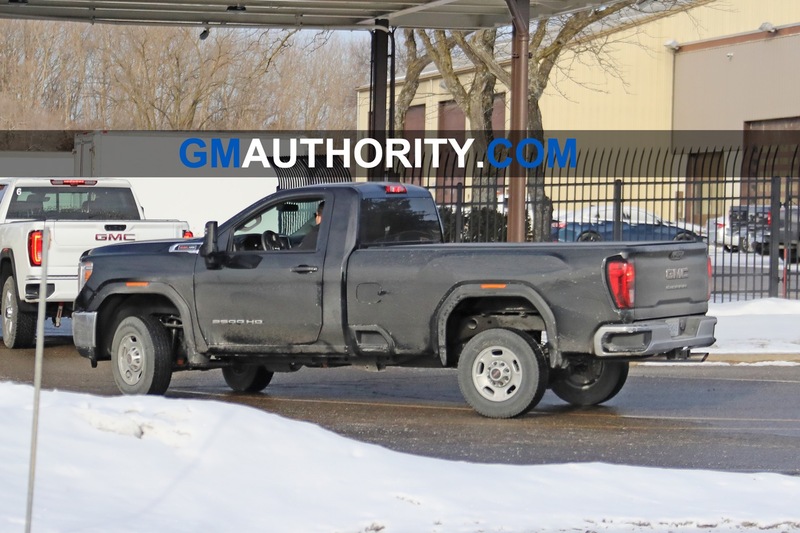 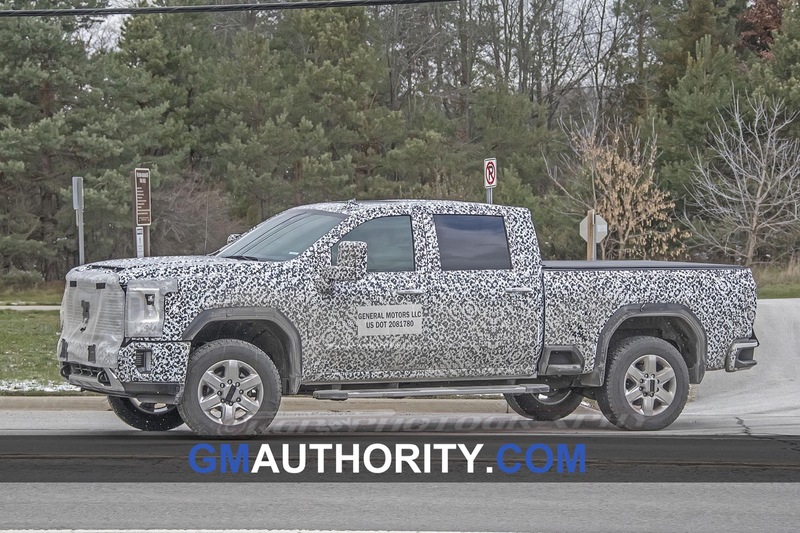 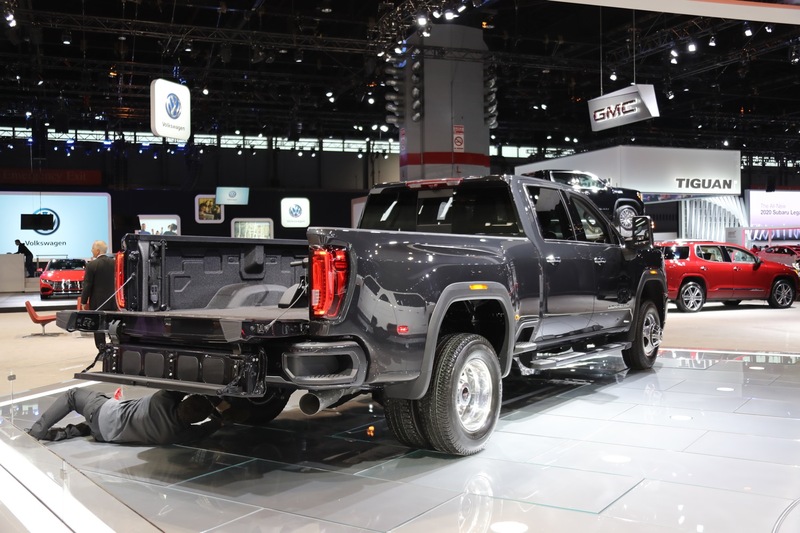 The rear end of this 2020 Sierra HD prototype is wearing a bit more camouflage than its corporate Chevy cousin, with a vinyl cover draped over the tailgate. 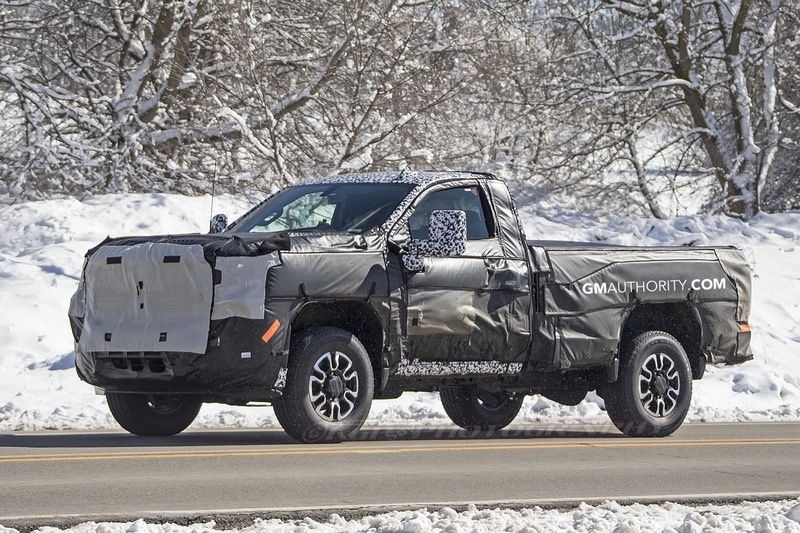 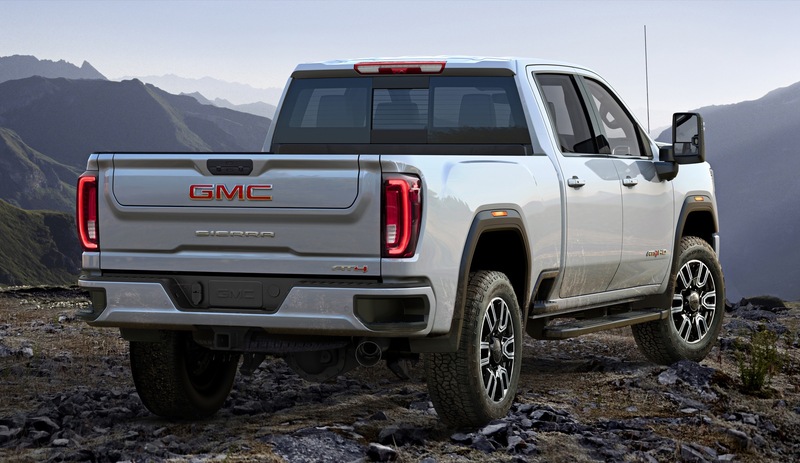 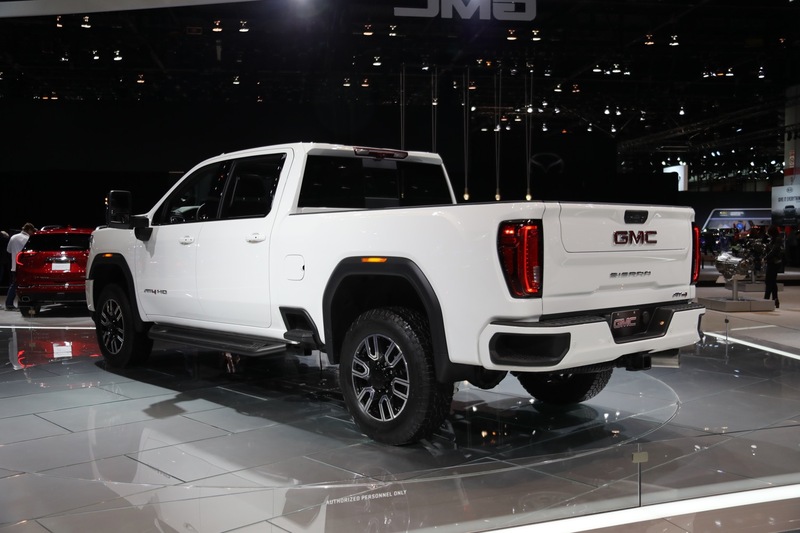 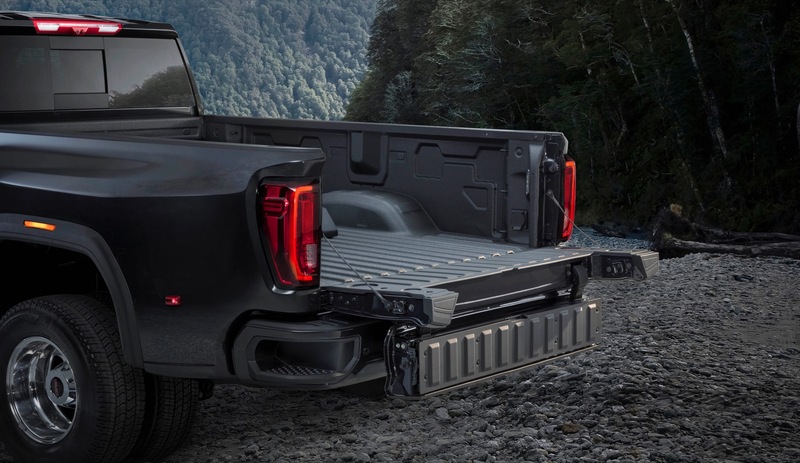 That’s likely because it will feature a variant of GMC’s new MultiPro tailgate that’s currently unique to the 2019 GMC Sierra 1500. 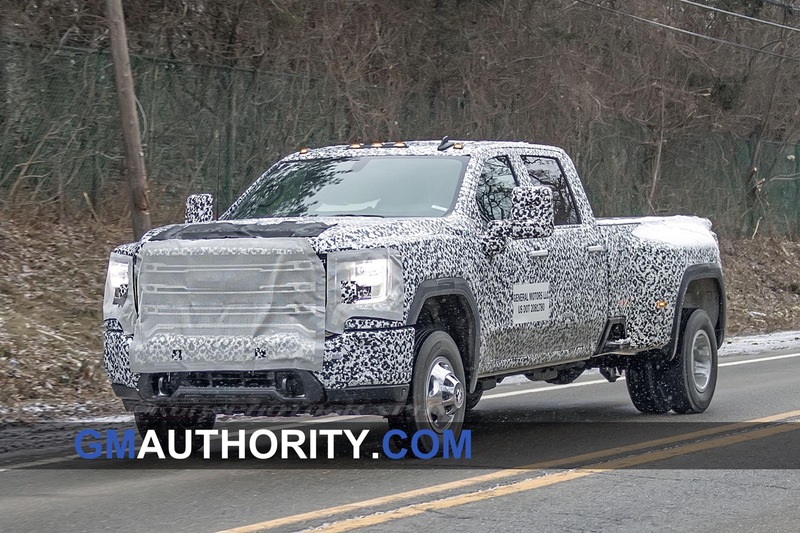 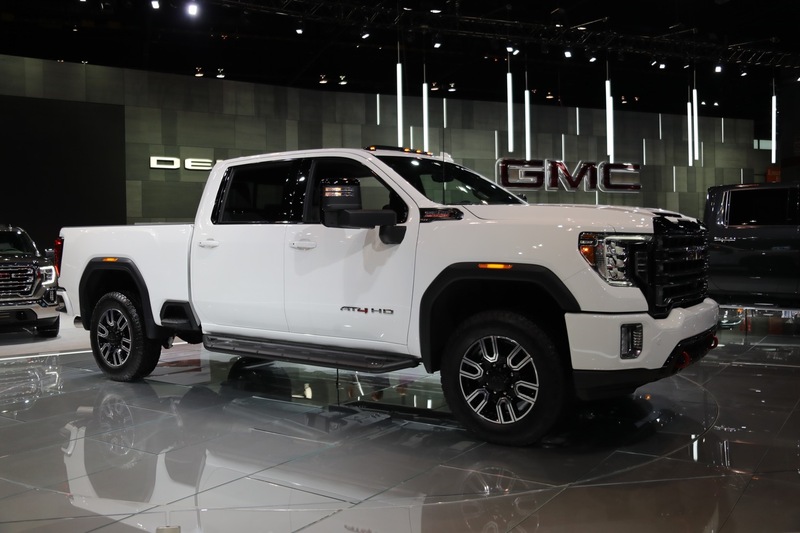 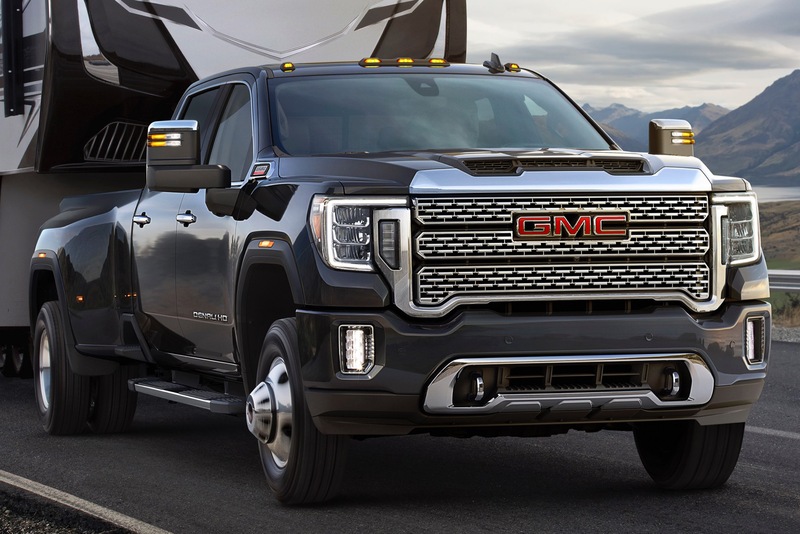 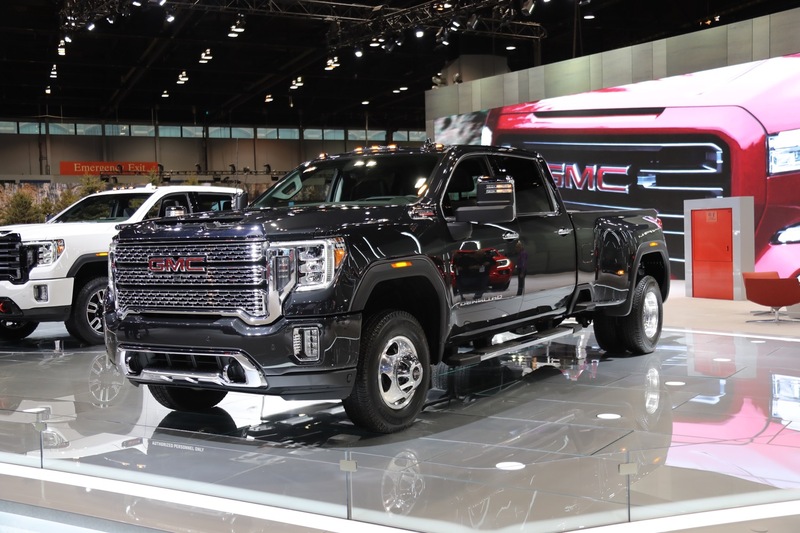 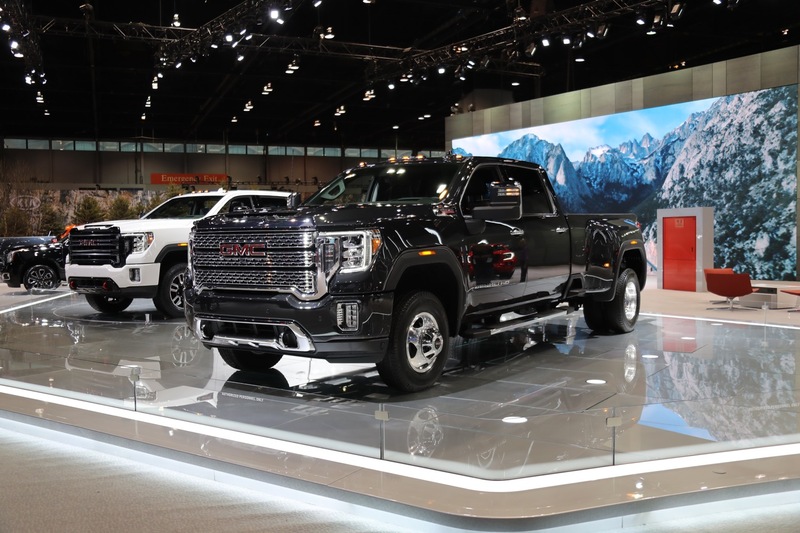 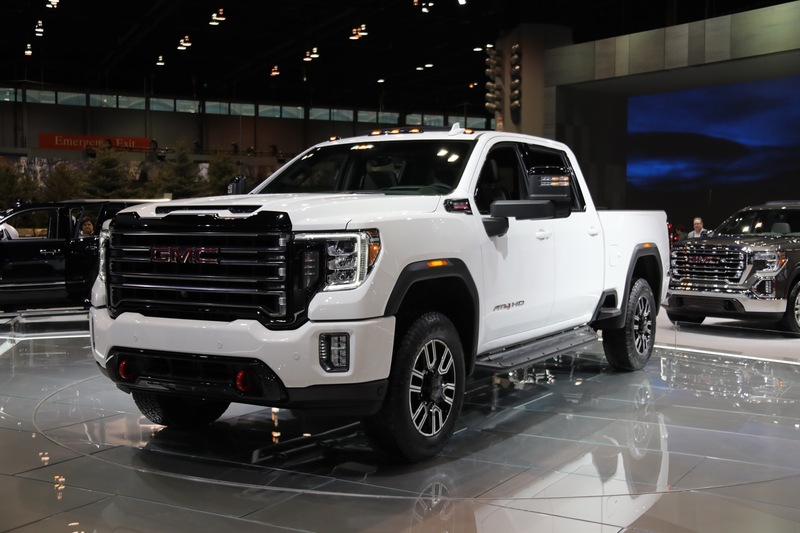 Expect the all-new 2020 GMC Sierra HD to launch some time in the 2019 calendar year. 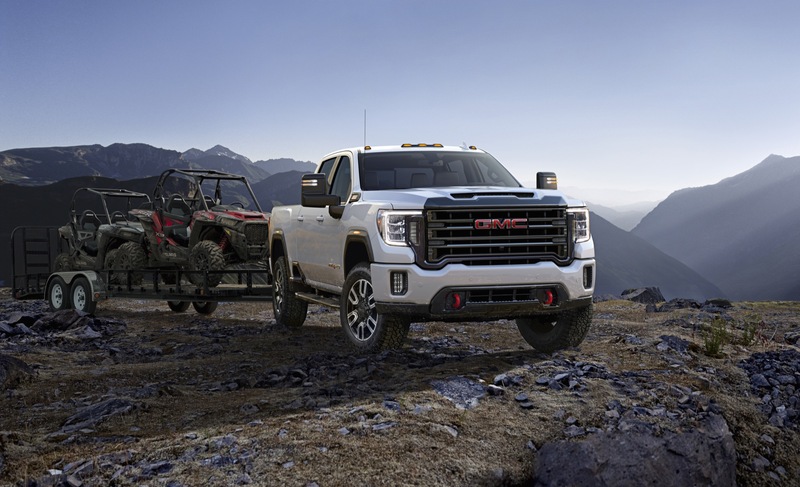 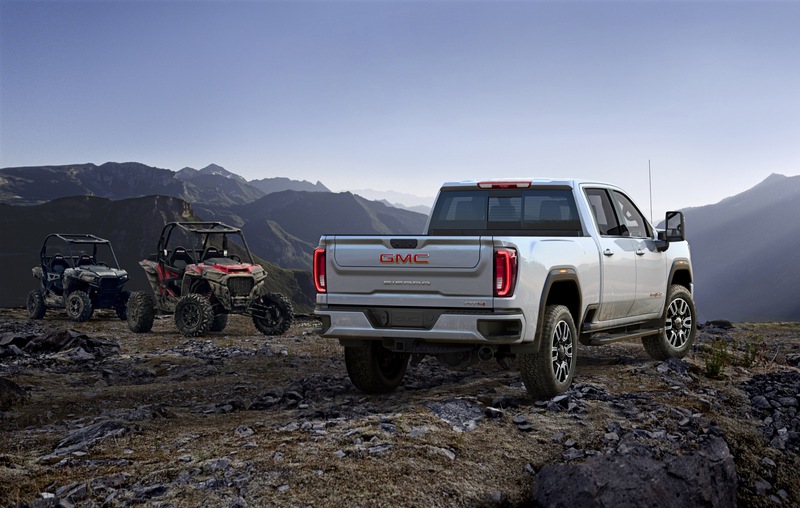 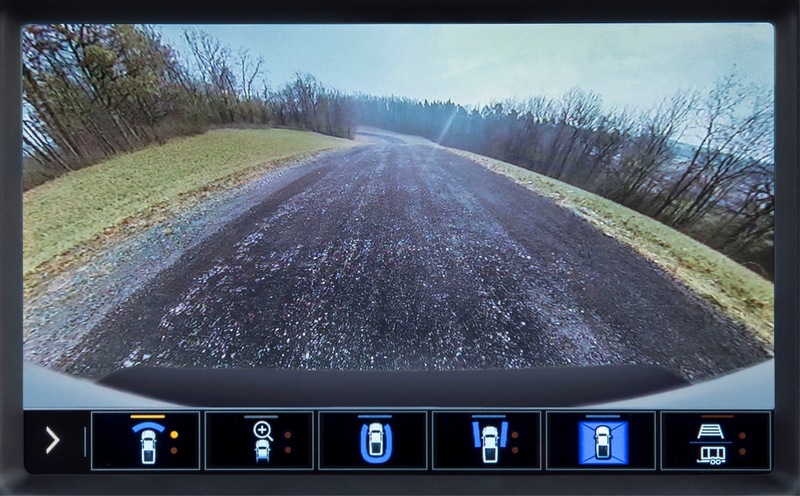 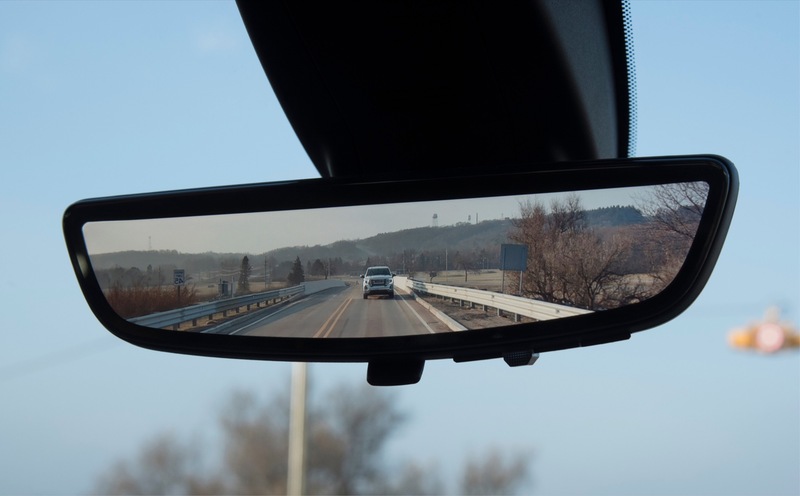 The range is expected to consist of the base SL model, the mid-range SLE and SLT, along with the range-topping Denali and off-road-oriented Sierra AT4 HD. 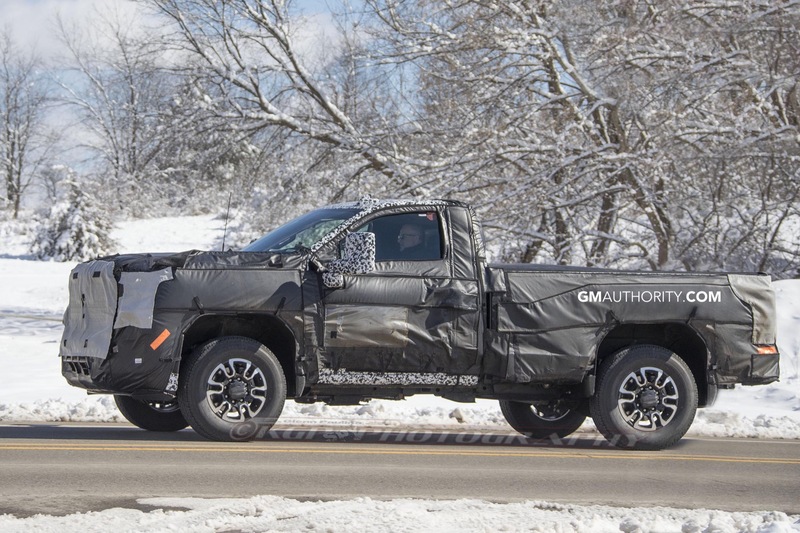 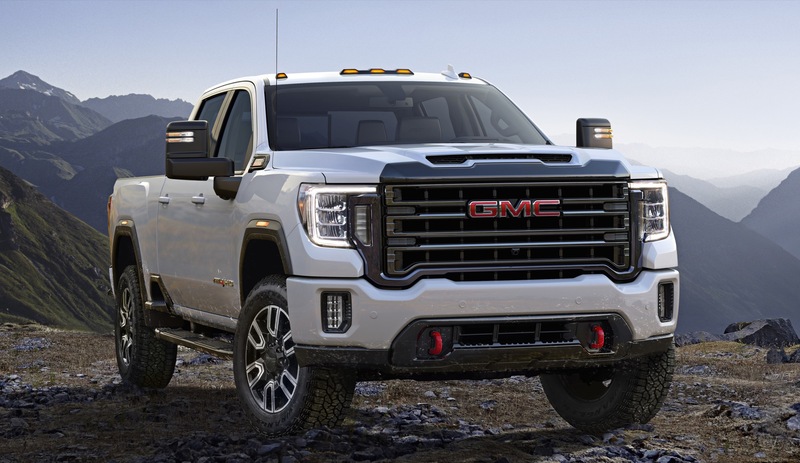 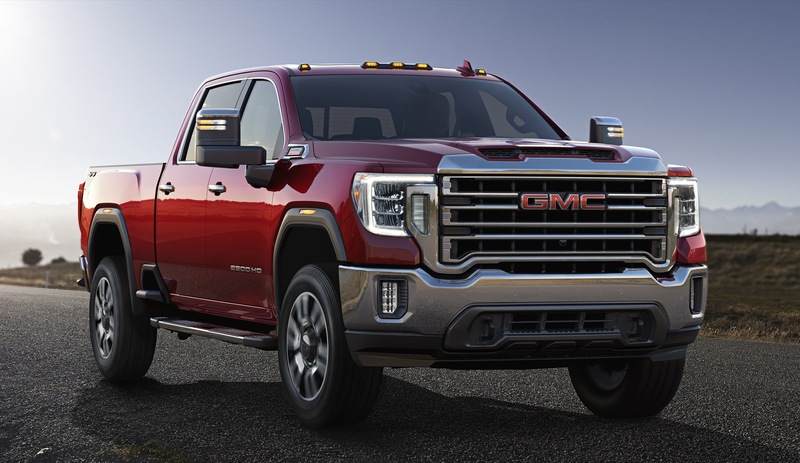 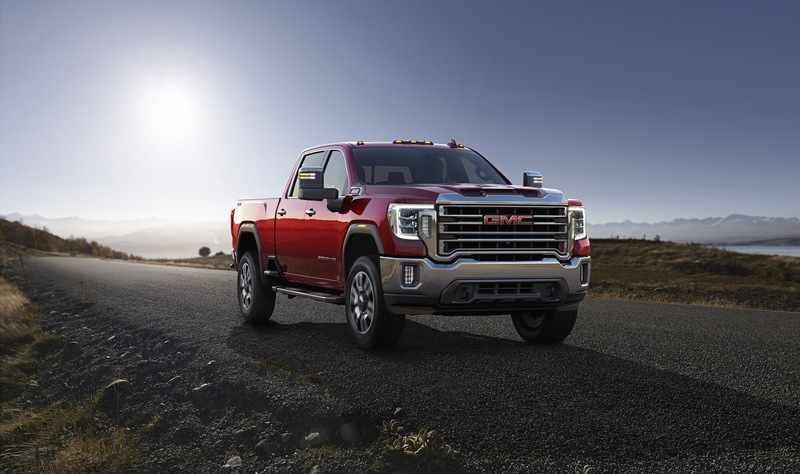 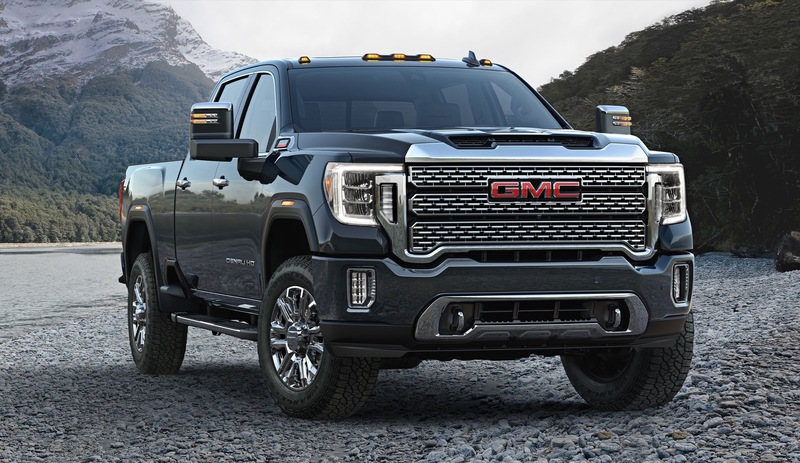 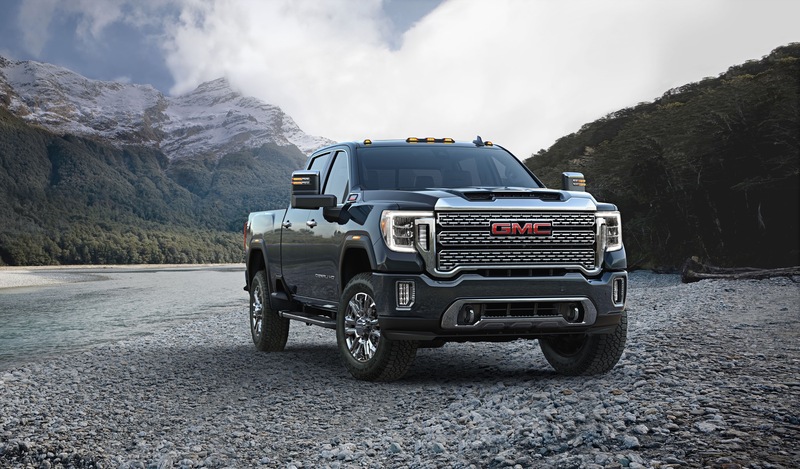 We expect the new GMC big boys to continue using the 6.6L Duramax L5P V8 engine while introducing a new Small Block, high-displacement V8 gasoline motor as the base powerplant. 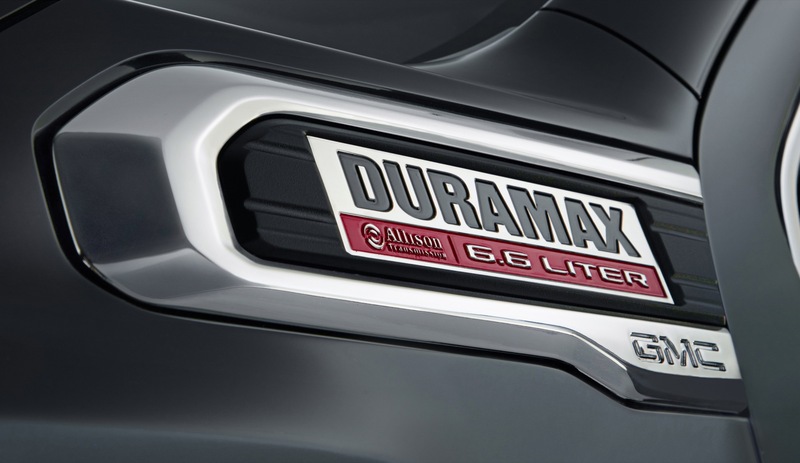 An all-new transmission range is also expected to make an appearance. 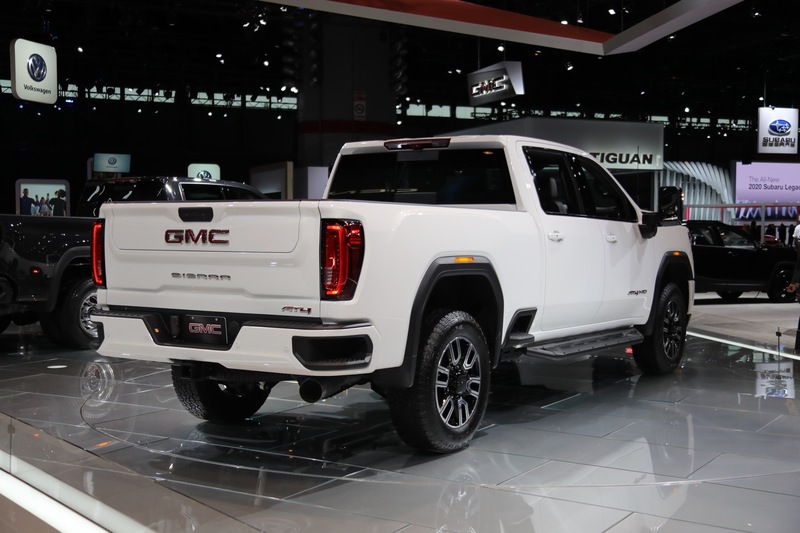 These two twins so far from what can be seen look real nice, after seeing the 1500 twins at a dealer last week they look clean and very upscale. 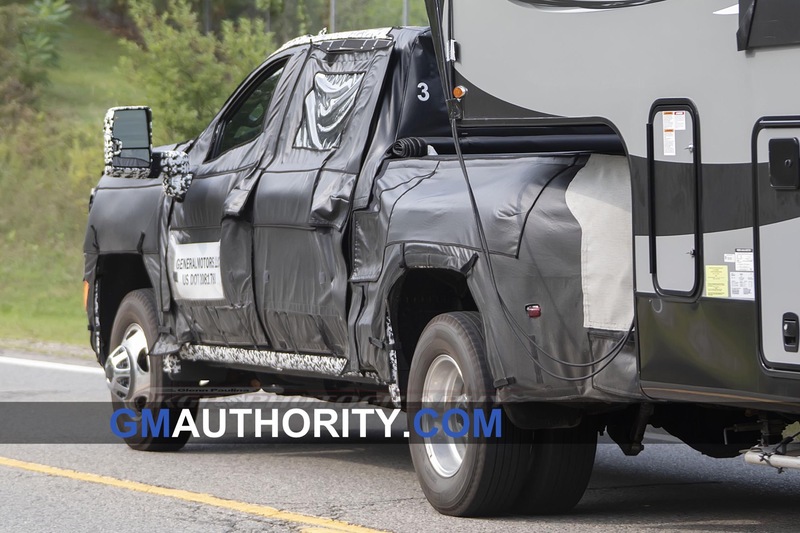 I don’t want to nit pick but if there a few things I would change they are…. 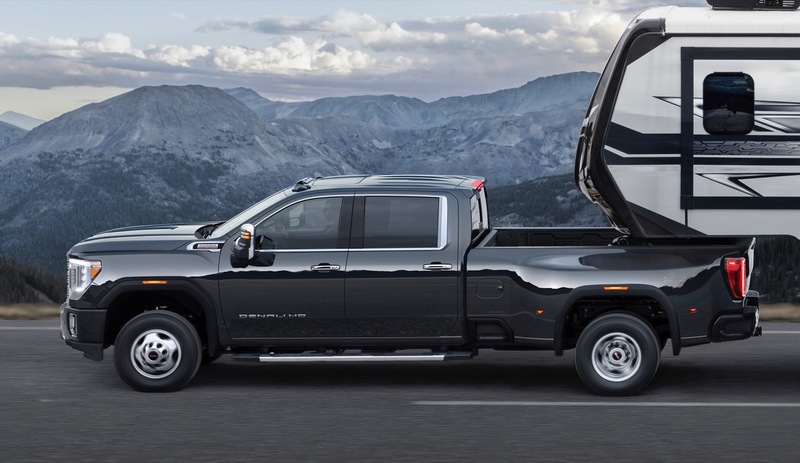 Change the location of the “Silverado” badge in the side to the door or remove it all together from the side. 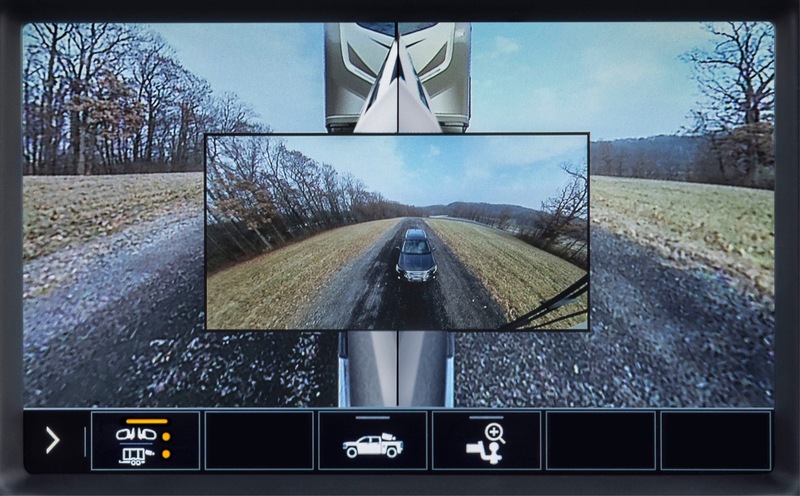 Add the digital gauge cluster to the LTZ SLT models. 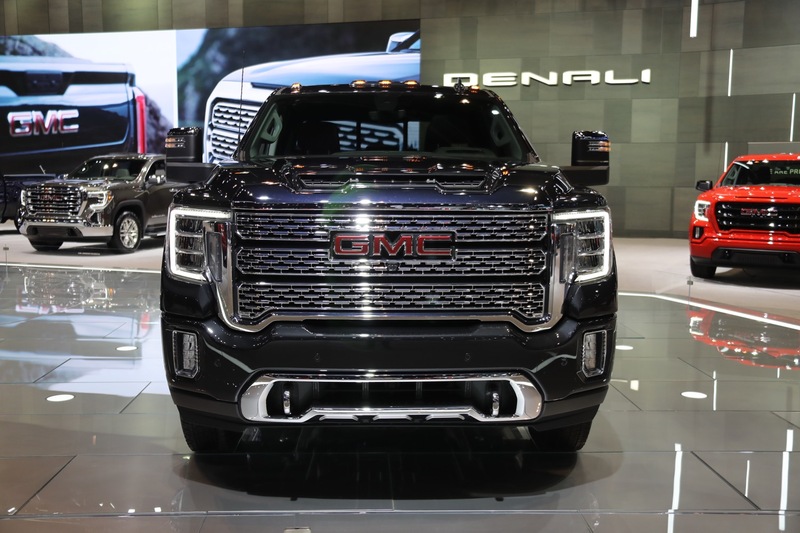 The trucks that I’ve seen were all top trim trucks Denali, high country, AT4 and the really stood out and I don’t mind the progression of the interior. 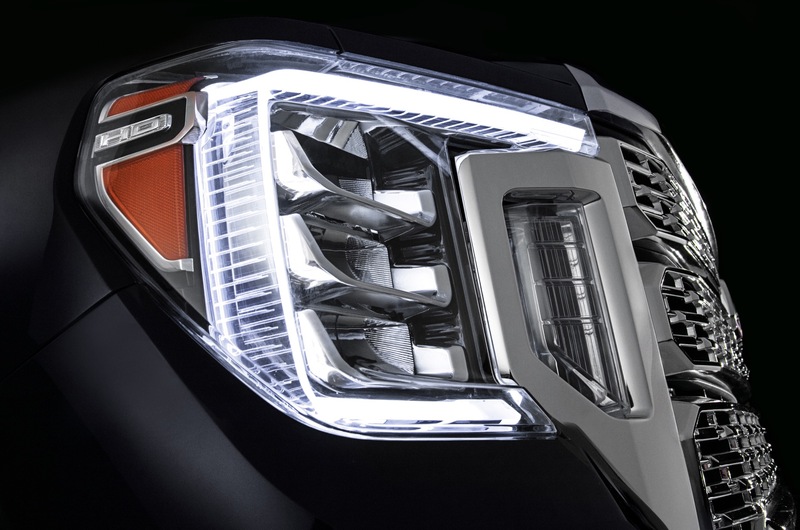 The Chevy HD headlight LEDs look better; these copy Ford’s. 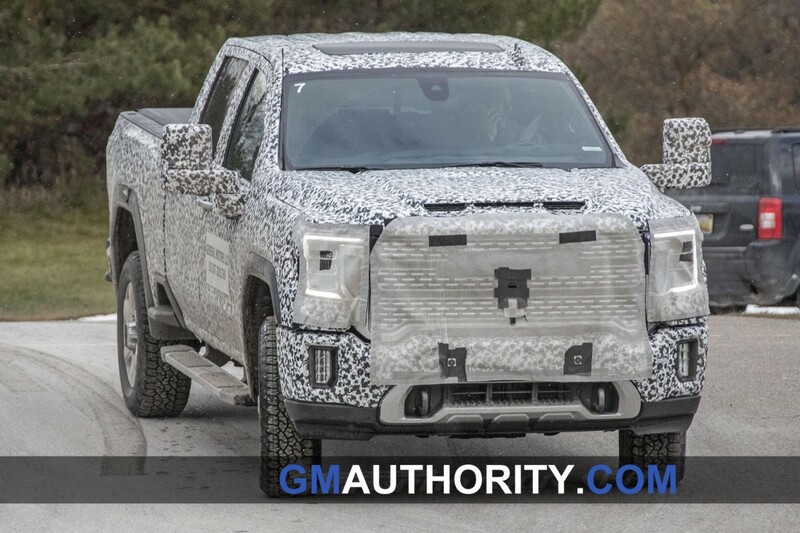 it’s clear that ford copied Chevy with it’s last generation of trucks. 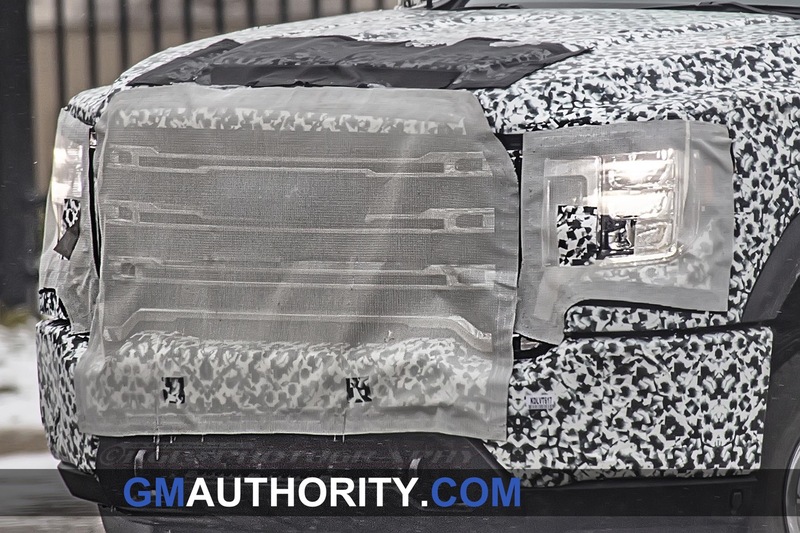 never before ford had stacked headlight, dual port grille, and a bar that runs across, now that pure Chevy DNA! 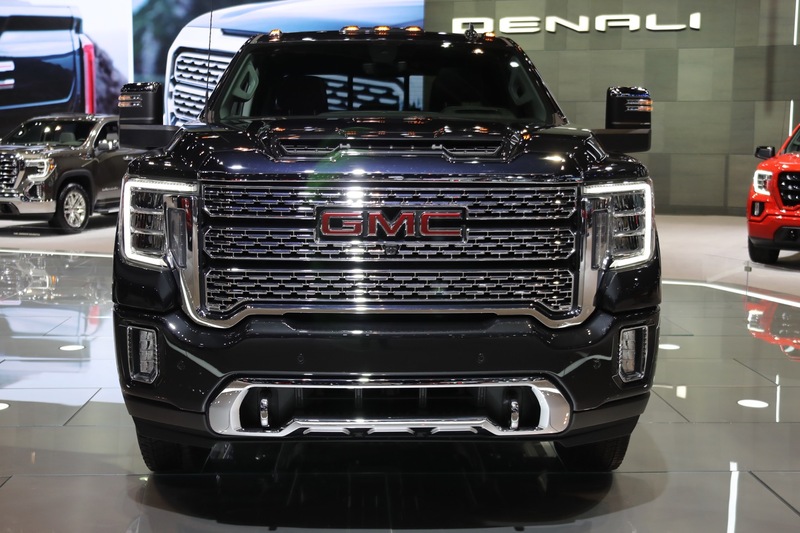 Oh and GMC had C shaped LED running lights well before ford did. 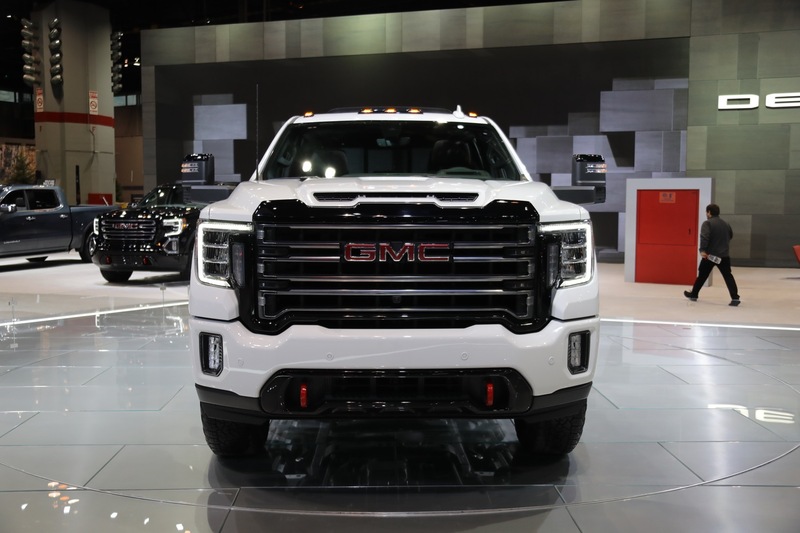 GMC did c- clamp headlights in their truck first. 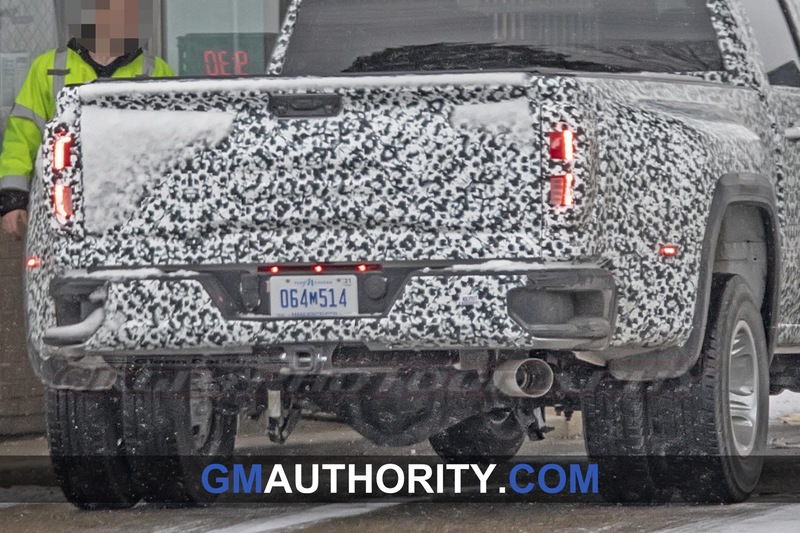 A lot of Fords design on their current trucks that people say GM copied, GM did first. 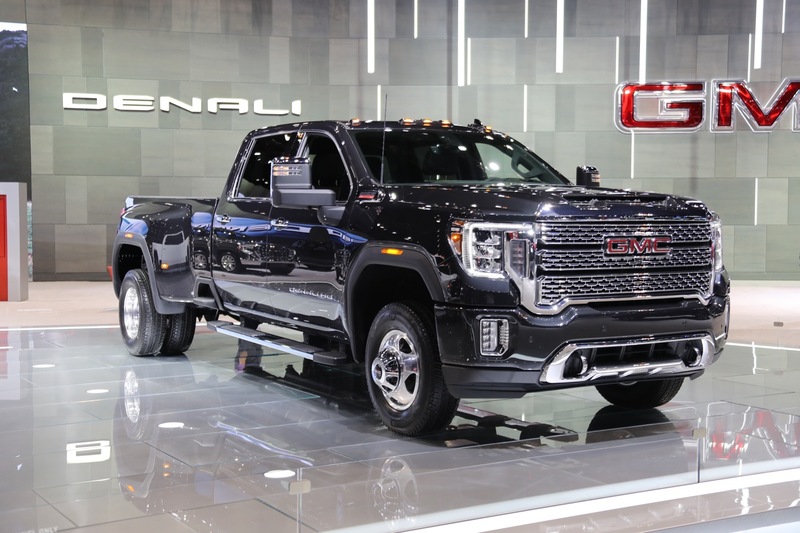 Love the trucks, but when you are comparing a top tier Denali trim to a Ram limited, the refinement and material quality and technology inside the ram just outshines the GM Twins. 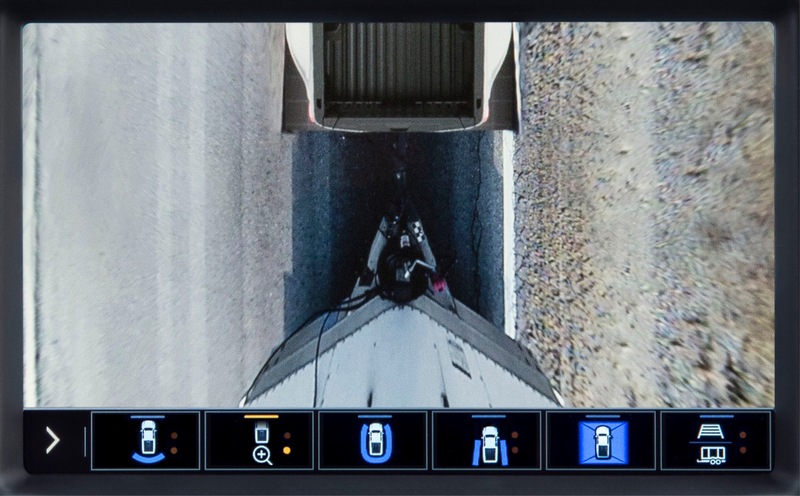 I’m sorry to point it out. 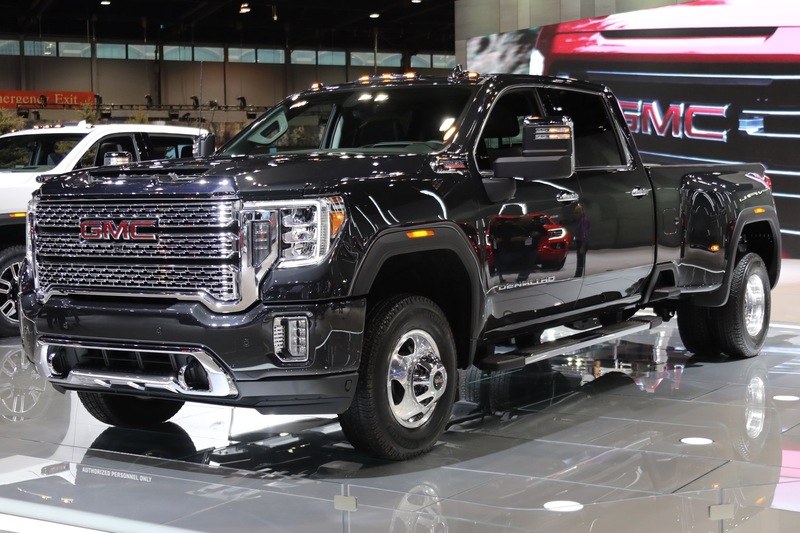 And, this is coming from a sales guy at a GMC store. 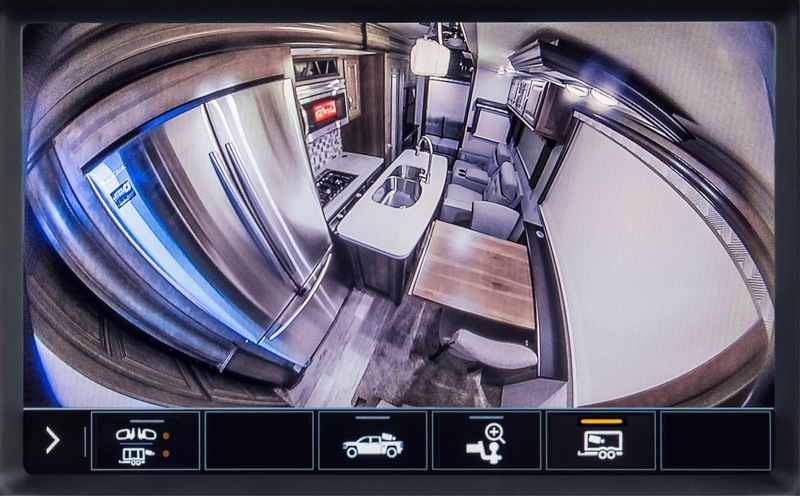 I showed a new 2019 yesterday to a good repeat customer, he loved the outside, and then he looked inside and said “Oh good! 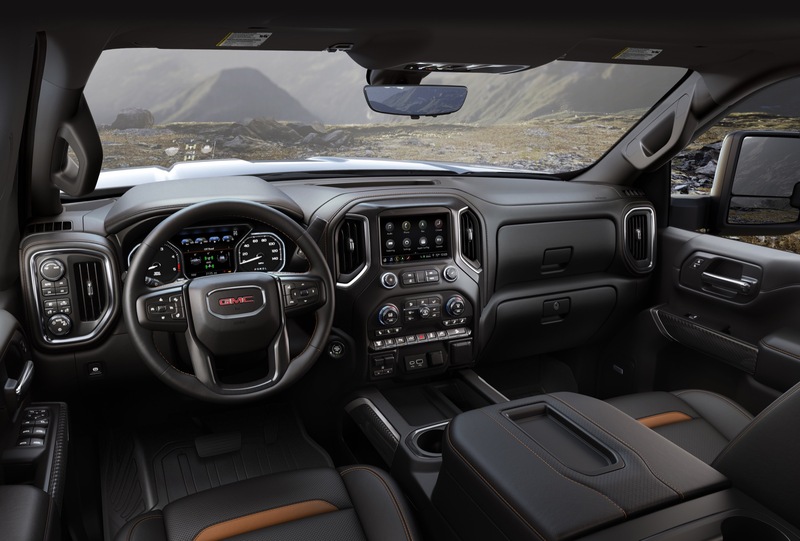 They have the same interior. 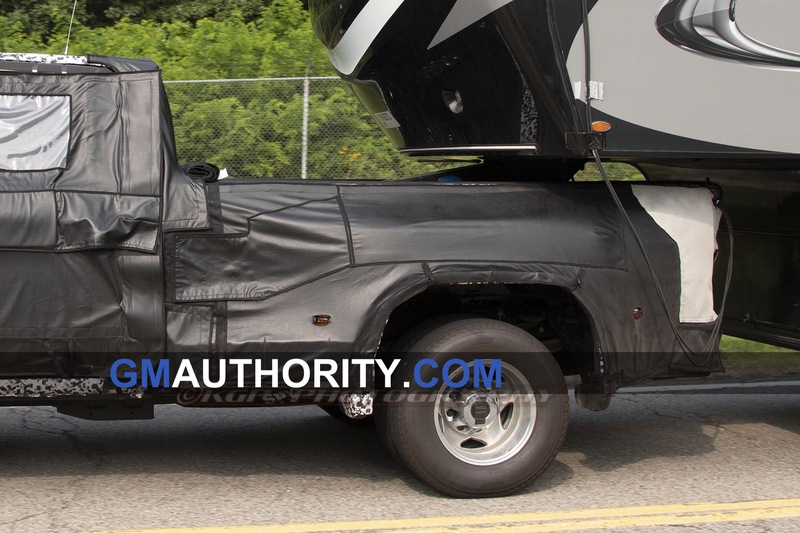 So they just changed the outside right?” it was tough pill to swallow on that one. 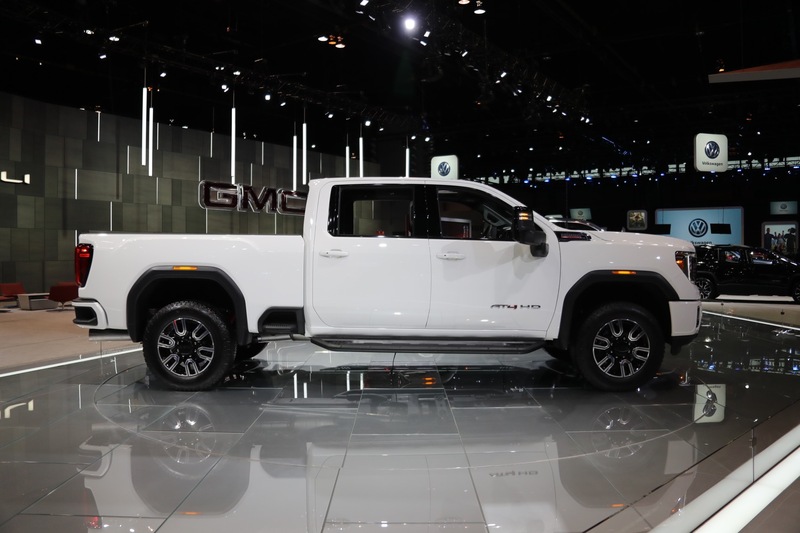 I work at a CDJR/Chevy dealership. 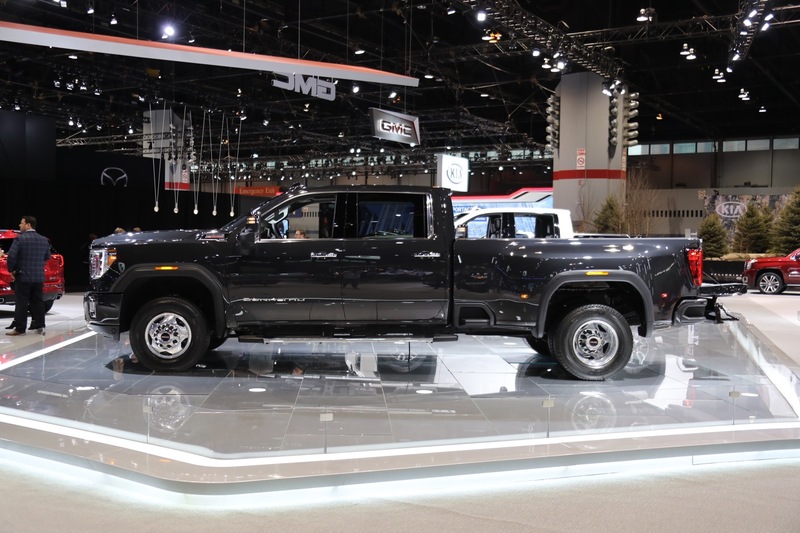 The new Silverado is underwhelming compared to the Ram. 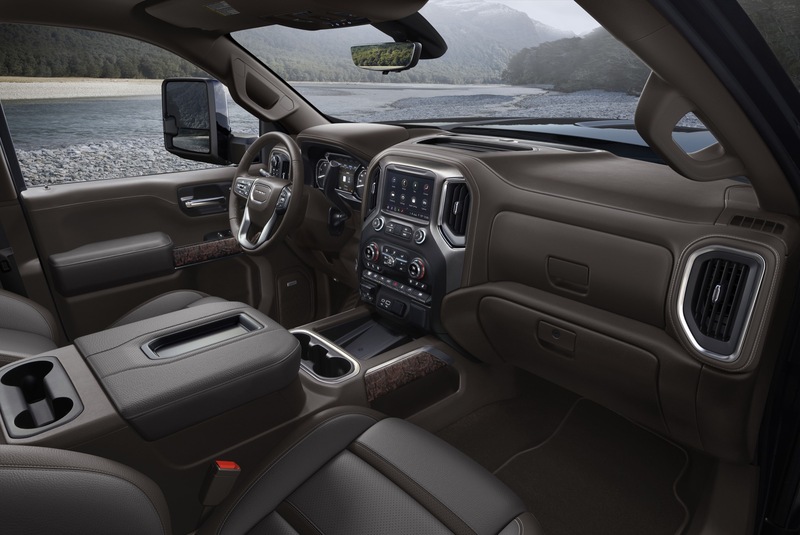 I wouldn’t say that Ram has a higher quality material, it definitely looks more upscale with its interior design, pano sunroof, and that 12″ screen . 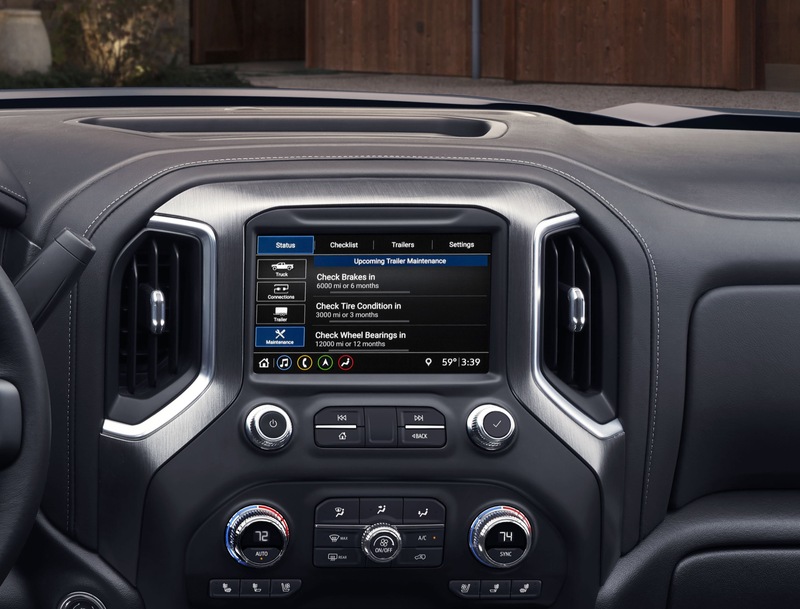 although I like the way things look in the Ram, but I do prefer the button layout in GM trucks, and how it’s more user friendly, and I absolutely hate climate control to be controlled via touch screen, that’s a deal breaker for me since I hate it in my wifes Acura. 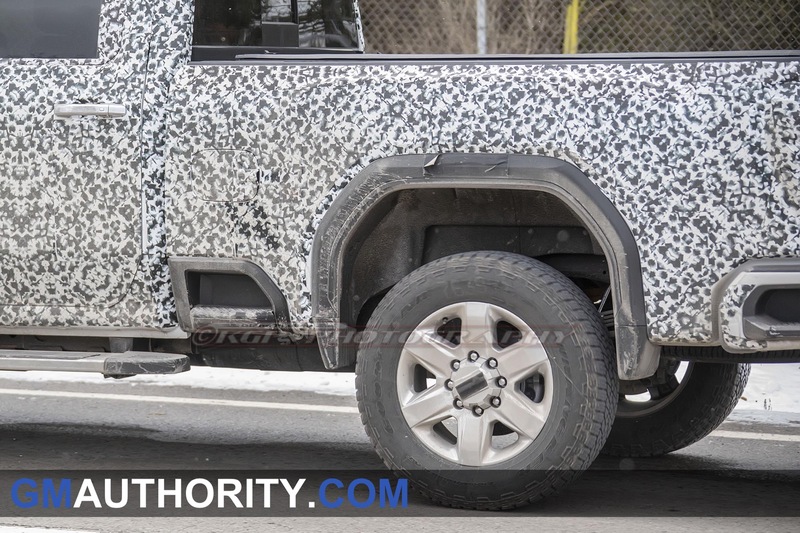 I am relieved they didn’t follow the same design for the wheel openings as the 1500 series Sierra. 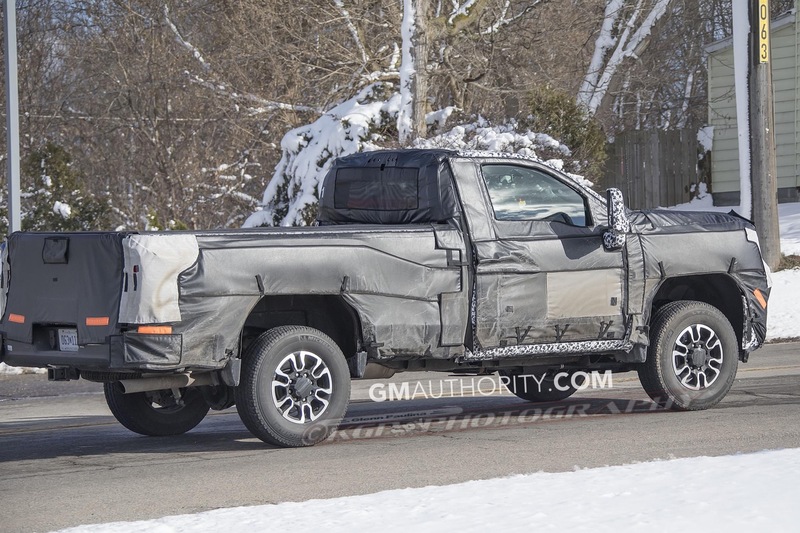 This looks better, no question about it. 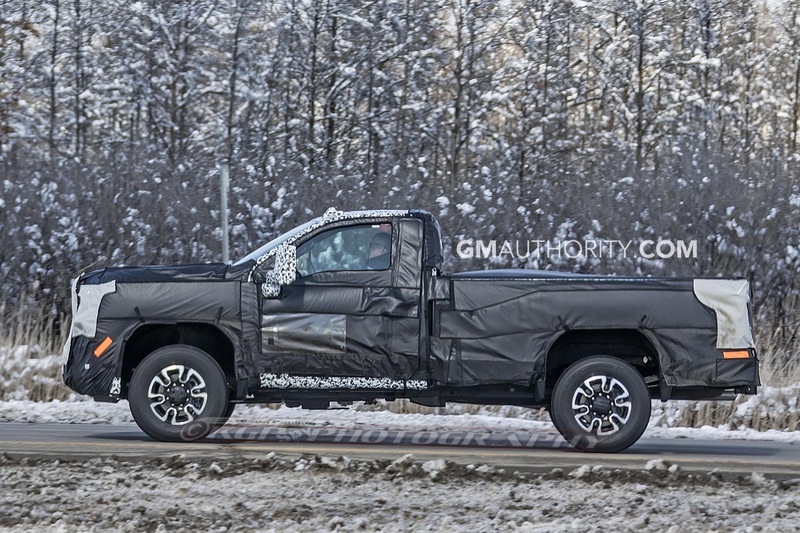 Some people here on commenting on a truck they haven’t even seen yet . 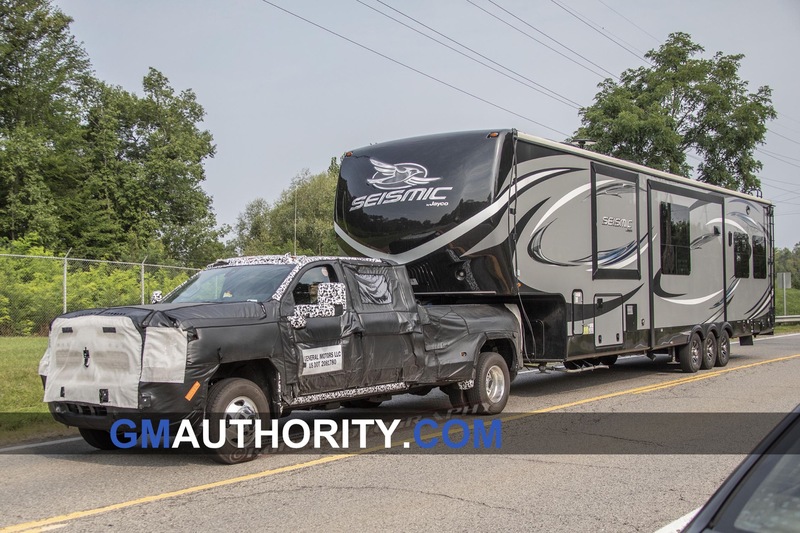 Cracks me up! 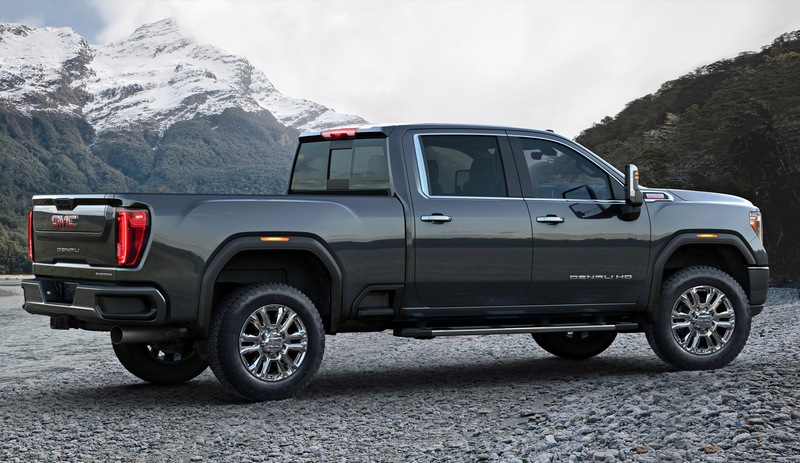 I mean this about the 2020 model is it not? 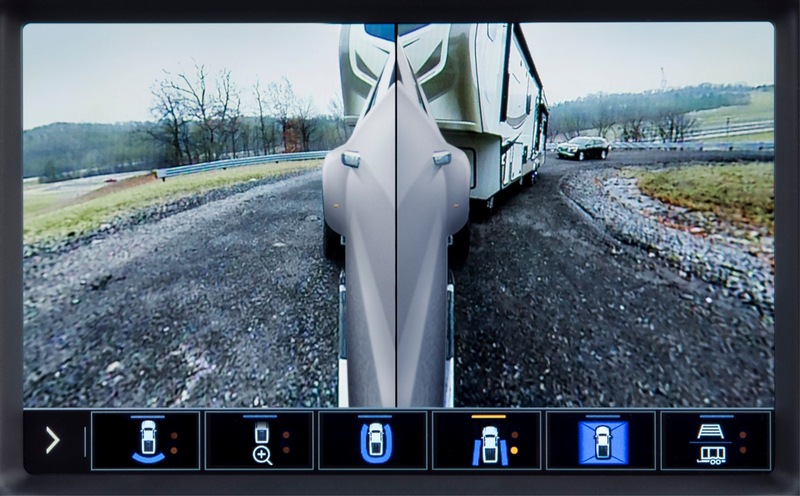 I don’t know about you, but I can see over 90% of the design! 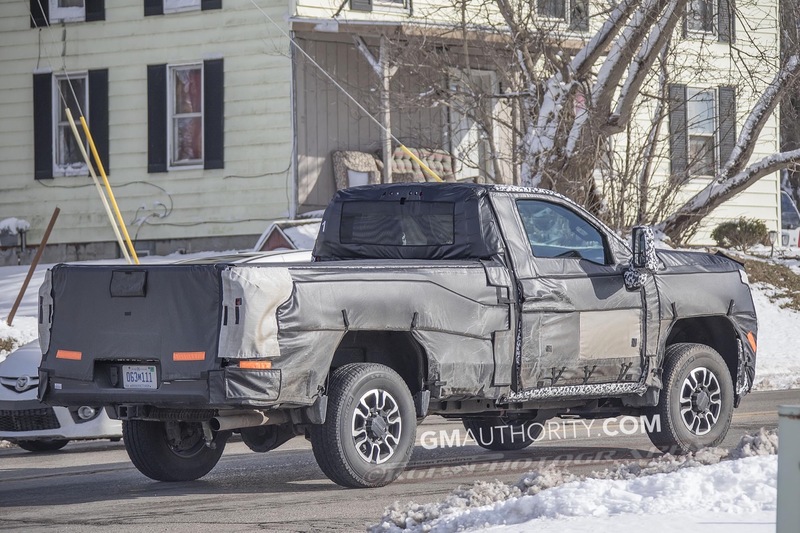 of coarse I don’t know the performance specs, but exterior is pretty obvious. 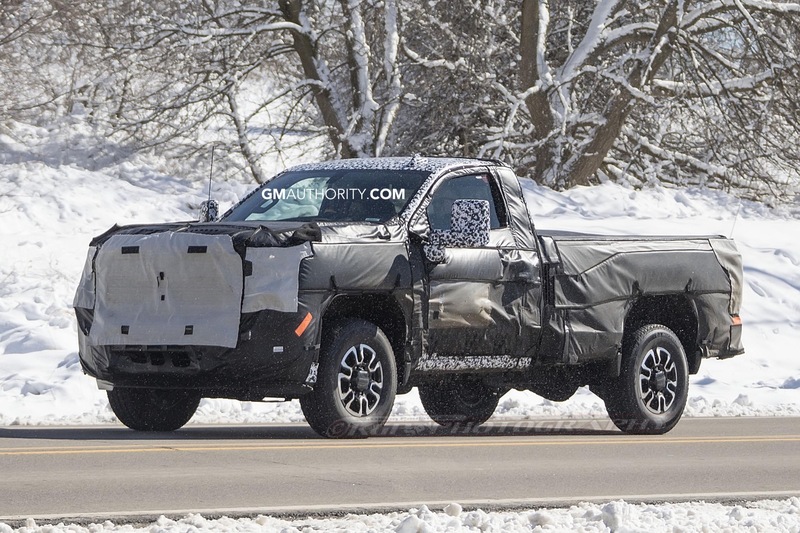 Overall cab looks same size as half ton, same dashboard (other spy pictures), but the C pillar is reskinned, doors are different, bed sides are different and of coarse the front end is completely different. 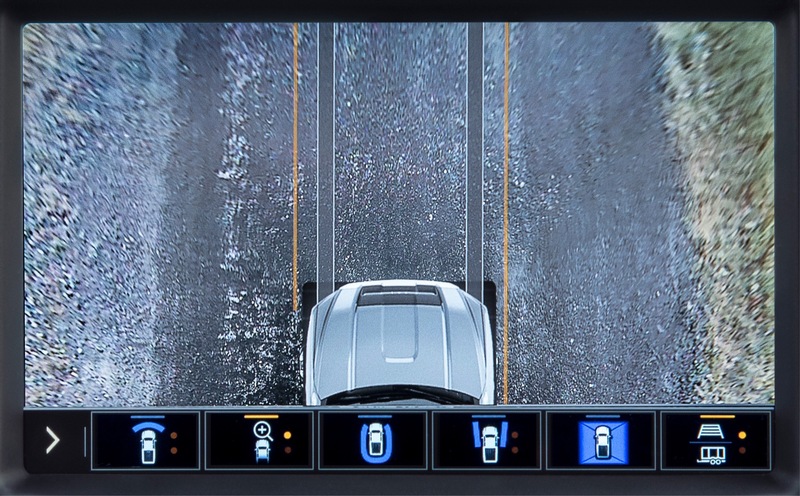 I like what I see (exterior). 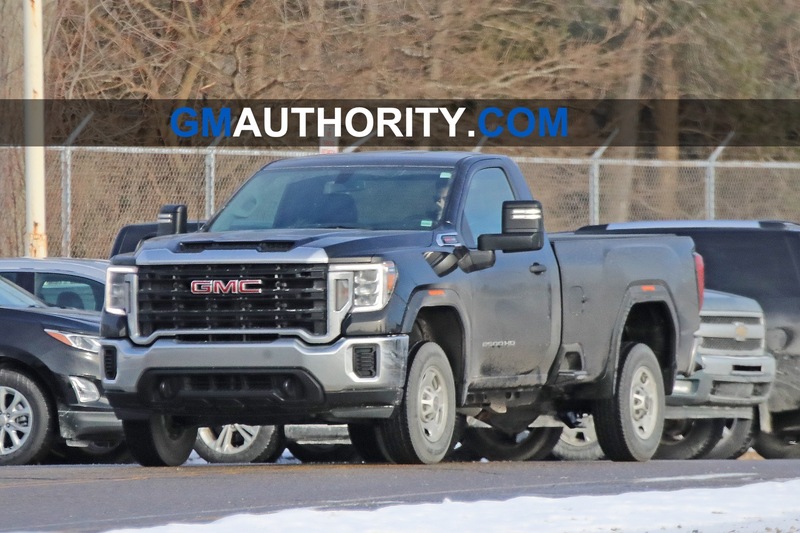 This already looks MUCH better than the Chevy! 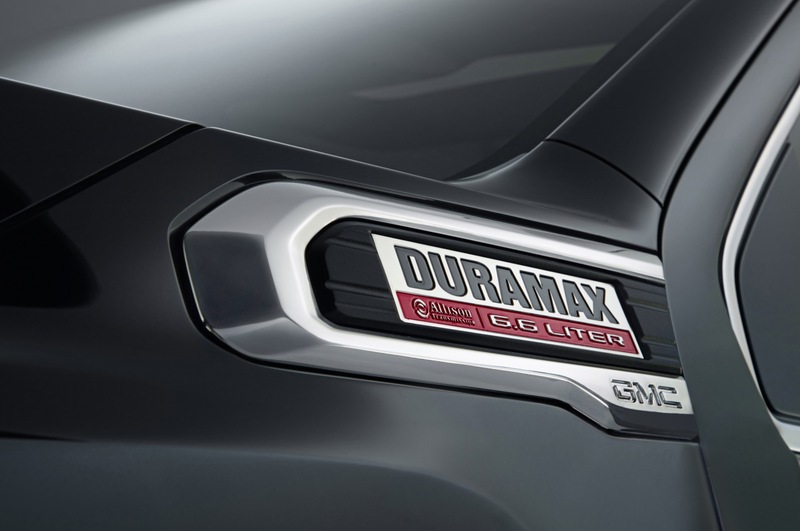 I also love that there is none of that “air curtain” BS under the headlights like in the 1500’s. 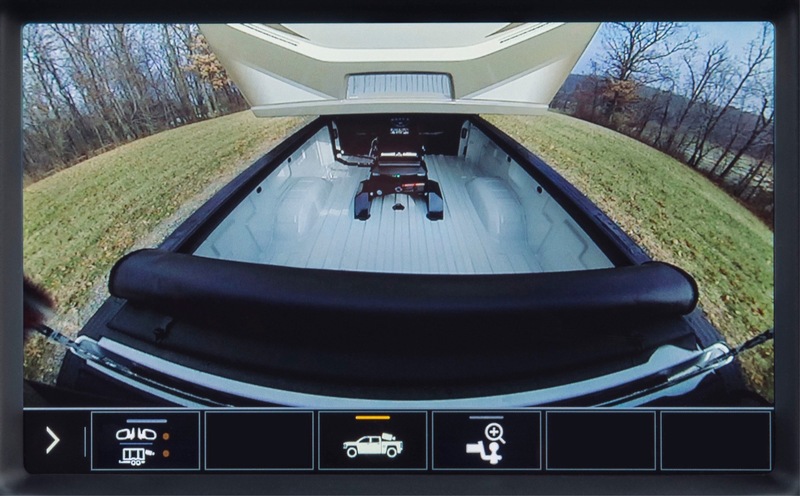 I’m a bit disappointed in the lack of a large moon roof, but I wasn’t really expecting it since the 1500’s dont have it.